This is a 3 5/8 inch closed 3 Blade Stockman. 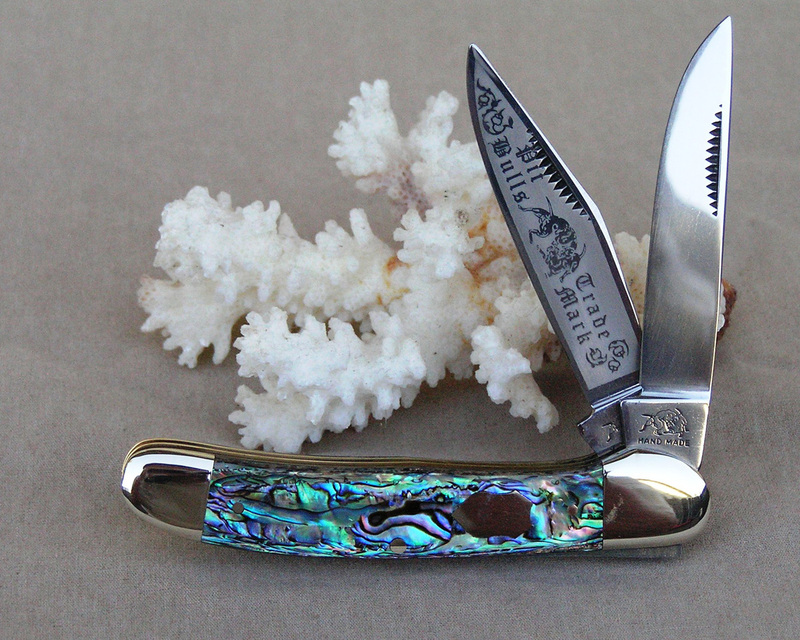 This knife features the Double Dog Head Tang Stamp. The master blade has NO ETCH and is engraved with ?1 OF 12? on the reverse. 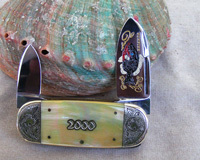 The handles are Genuine Green Heart Abalone with Short Heraldic Shield. 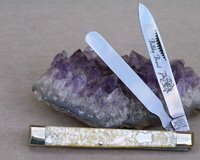 This is a RARE knife, only 12 knives were made in this configuration. This is a 3 ? inch closed 2 Blade Copperhead. This knife has the Double Dog Head tang stamp. The master blade is etched with the Tennessee Walking Horse etch. 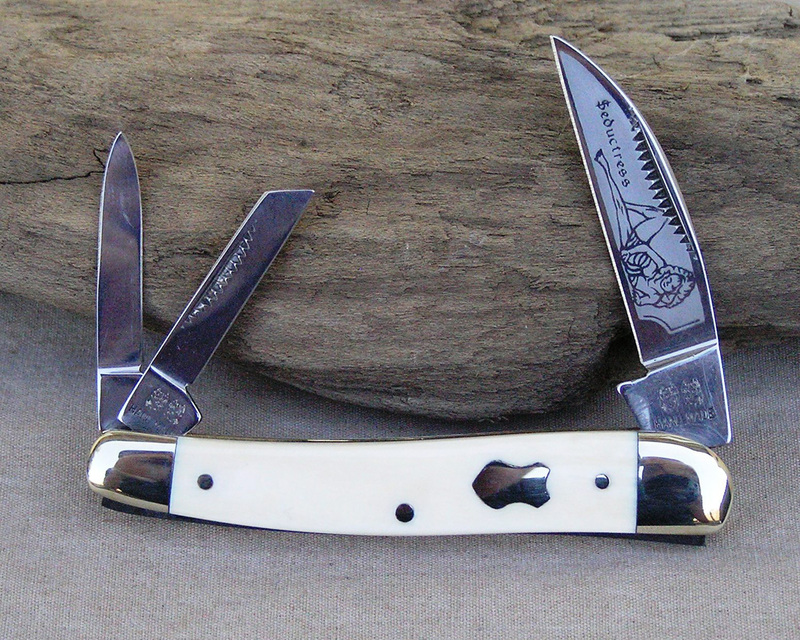 The handles are Winterbottom Stag with a Crest shield. This is a 3 3/4 inch 4 Blade Congress Kentucky Thoroughbred knife. Features the Double Dog Head tang stamp. The master blade is etched with the Kentucky Thoroughbred etch. The reverse of the master blade is engraved with “1 of 4″. 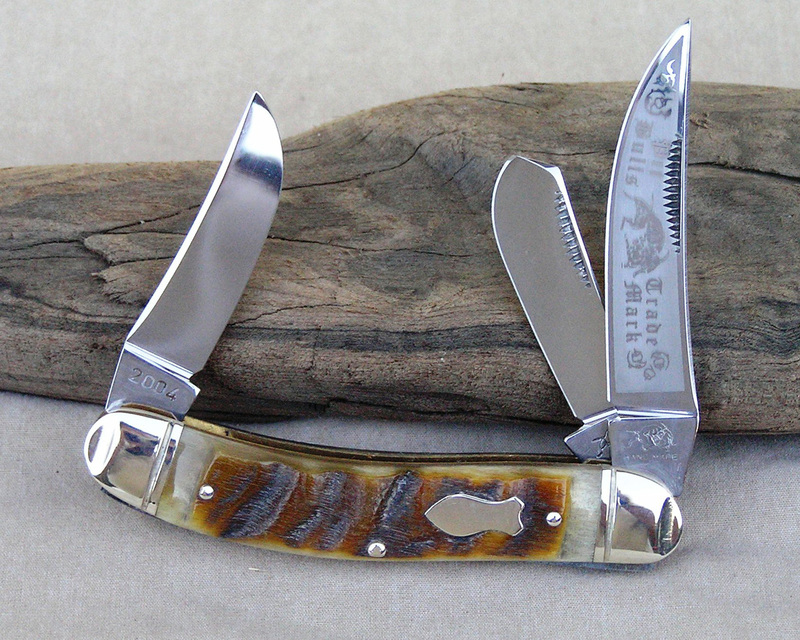 The handles are Genuine Stag with a Heraldic Shield. 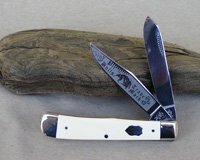 This is a very low run knife with only 4 made! 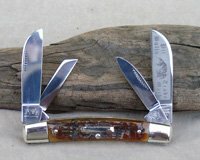 This is a 4 1/8 inch closed 2 Blade Trapper. This knife has the Double Dog Head tang stamp. The master blade is etched with the Tennessee Walking Horse etch. 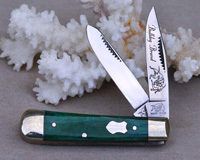 The handles are Winterbottom Stag with a Crest Shield. HAND MADE KNIFE in the Friedrich Olbertz factory where Bulldog Brand and Fightn? 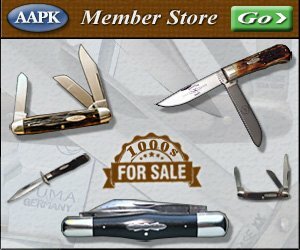 Rooster knives are made. 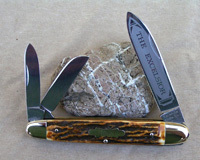 This is the 3 blade 4 1/2 inch Whittler, The Excelsior model. 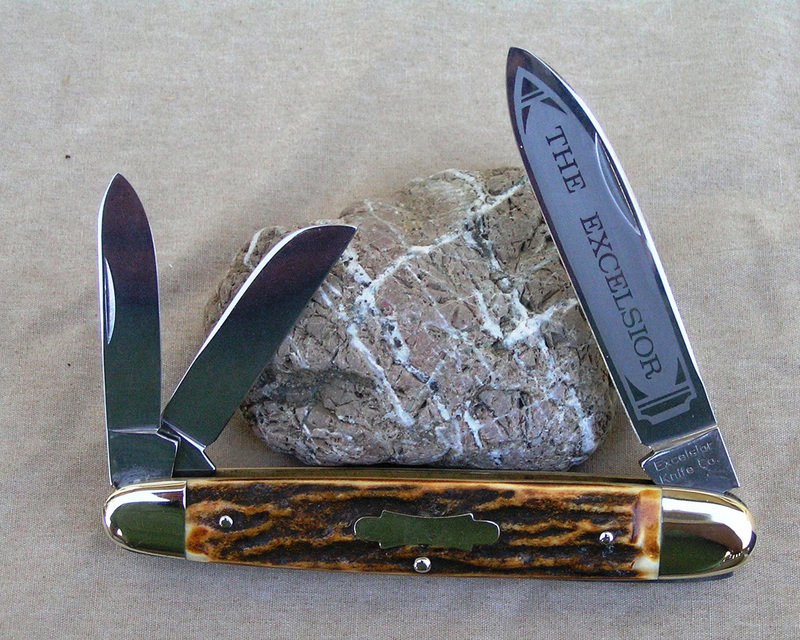 The tang is stamped with Excelsior Knife Co. stamp with a reverse frost etch on the master blade of The Excelsior. 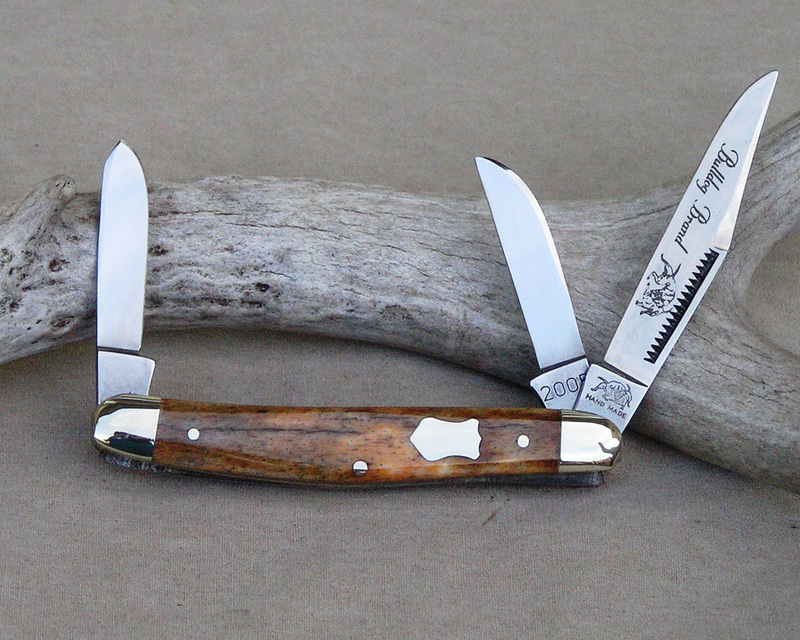 The handles are Genuine Stag with a Bowtie shield. This is a 3 1/2 inch SINGLE blade Canoe. The Single blade has the Standing Dog 2000 tang stamp. 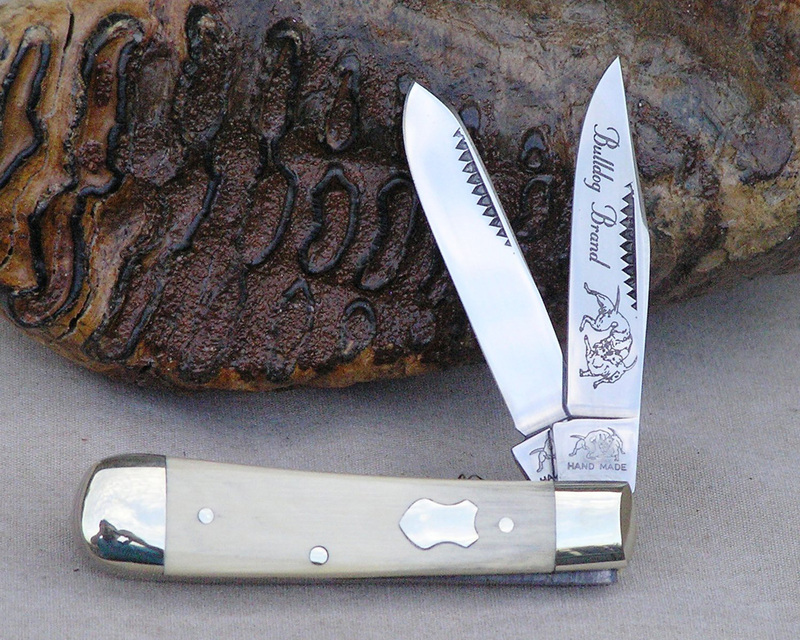 The SINGLE blade has the RARE Standing Dog Bulldog Brand etch. The reverse is engraved with 1 OF 7. 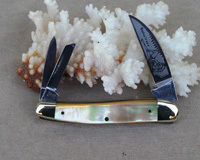 The handles are Oystershell Celluloid with the Crest Shield. This is a RARE 1 Blade Canoe that was made at the start of the Fifth Generation. This is NOT a Lockback, made in 2000, only 7 were made. This is a 4 1/4 inch closed 2 blade Elephant Toe. The master blade is etched with the full color Elephant etch with Prototype engraved on the reverse. The tang is stamped with the Double Dog Head Stamp. 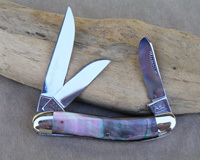 The handles are Cranberry Swirl celluloid with a bowtie shield. This is a 3 5/8 inch closed 3 Blade Stockman. 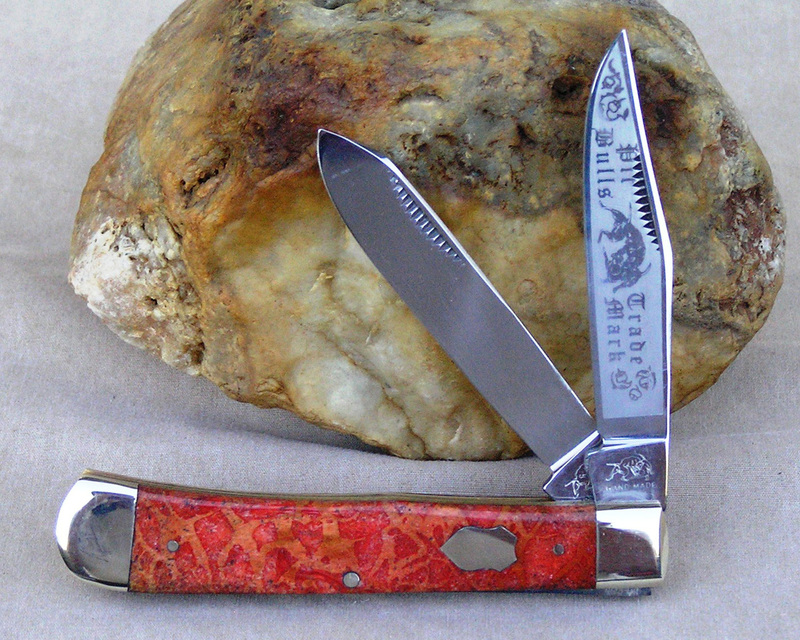 This knife features the Double Dog Head Tang Stamp. The master blade has NO ETCH and is engraved with “Prototype” on the reverse. 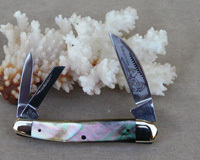 The handles are Genuine Green Heart Abalone with NO Shield. This is a RARE knife, only 1 prototype and 4 others were made in this configuration for a total of only 5 made. This is a 3 1/2 inch SINGLE blade Canoe. The Single blade has the Standing Dog 2000 tang stamp. 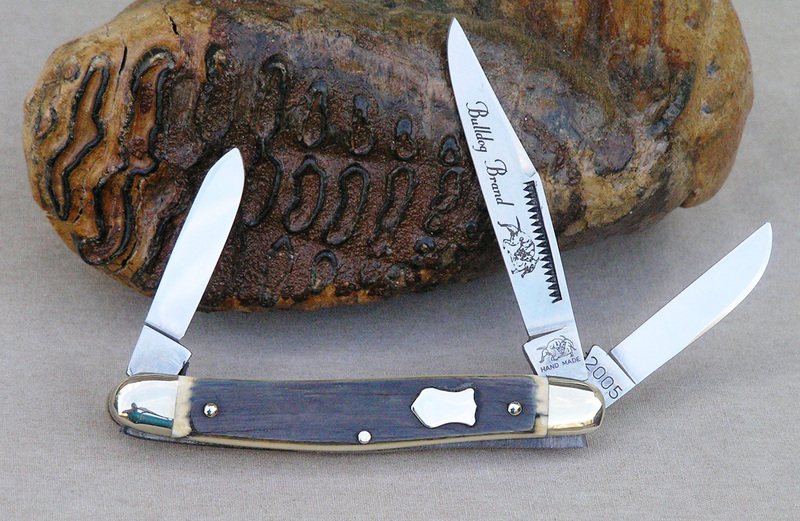 The SINGLE blade has the RARE Standing Dog Bulldog Brand etch. The reverse is engraved with 1 OF 7. 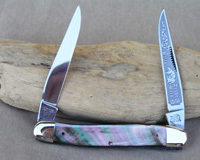 The handles are Purple Swirl Celluloid with the Crest Shield. This is a RARE 1 Blade Canoe that was made at the start of the Fifth Generation. This is NOT a Lockback, made in 2000, only 7 were made. 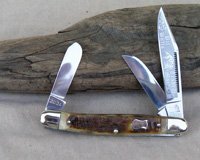 This is a 4 1/8 inch closed Trapper. 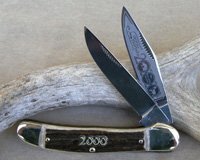 This knife features the Double Dog tang stamp on the master blade and the Standing Dog 2000 tang stamp on the secondary blade. The blades have no blade etch and the master blade is engraved “Prototype Winterbottom Stag” on the reverse. 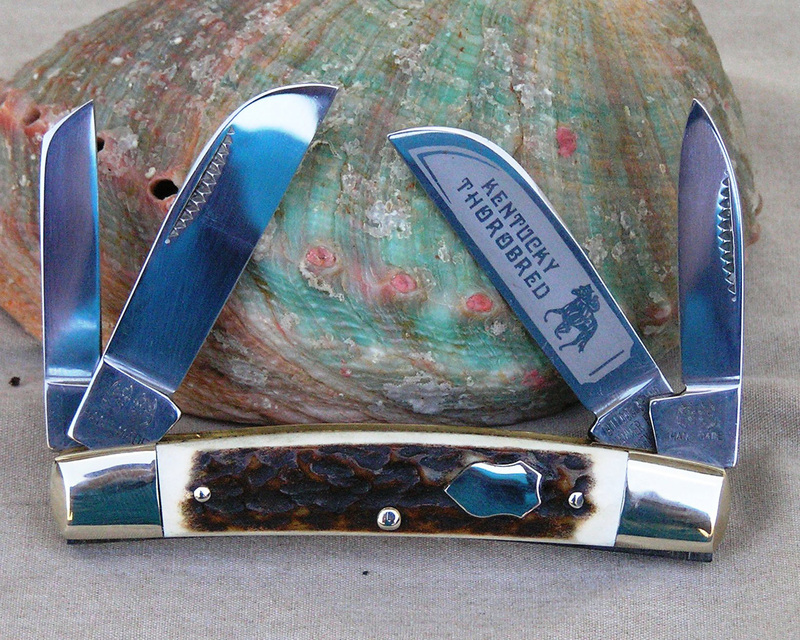 The handles are WinterBottom Stag with the round Bulldog Shield. This is a 4 blade Congress. The overall length closed is 3 1/2 inches. The master blade is missing the frosted etch of Fighting Pit Bulls. The Blades are also from 1995, yet the bar shield says 25 years. The reverse of the master blade is engraved with ?Prototype?. The handles are Genuine Bone. This knife comes with a COA. 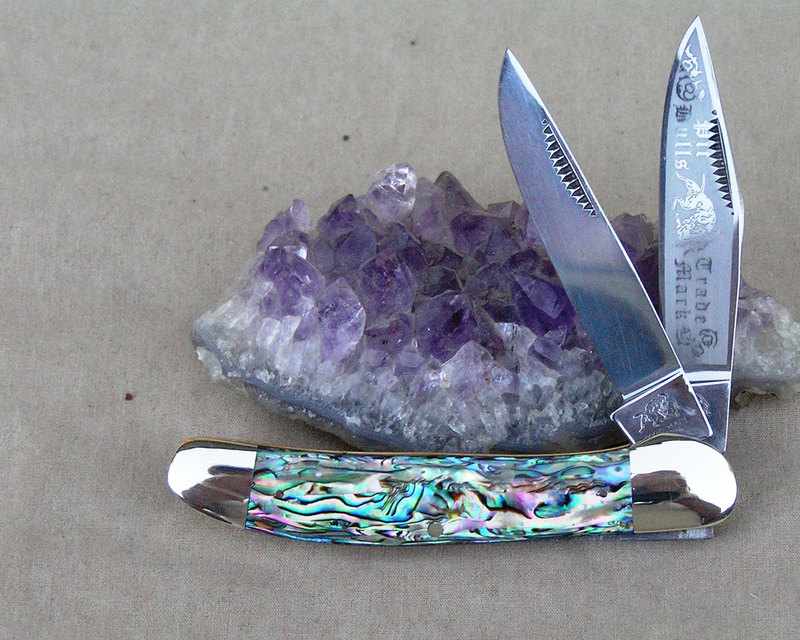 This is a RARE factory error and this knife is very RARE, being 1 of 2 made. This is a 4 blade Congress. The overall length closed is 3 1/2 inches. The master blade has No Etch and No Shield. The reverse of the master blade is engraved with ?Prototype?. The handles are Genuine Himalayan Sheephorn. This knife comes with a COA. This is a 3 3/4 inch closed 2 blade Copperhead. This knife has the discontinued Fighting Bulldog tang stamp. 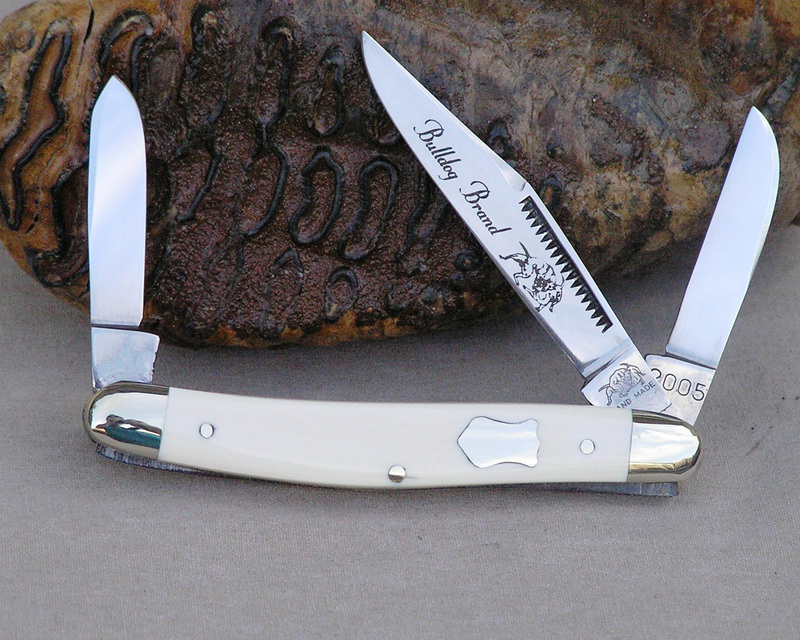 The master blade features the frosted Pit-Bull Trademark etch. The reverse of the master blade is engraved with ?Prototype?. The handles are Black Lip Pearl. This knife comes with a COA. This is a 3 3/4 inch closed 2 blade Copperhead. This knife has the discontinued Fighting Bulldog tang stamp. The master blade features the frosted Pit-Bull Trademark etch. The reverse of the master blade is engraved with ?Prototype?. The handles are Genuine Heart Abalone. This knife comes with a COA. This knife has a Heraldic Shield, I have another without a shield that is very rare. This is a 3 3/4 inch closed 2 blade Copperhead. This knife has the discontinued Fighting Bulldog tang stamp. The master blade features the frosted Pit-Bull Trademark etch. The reverse of the master blade is engraved with “Prototype”. 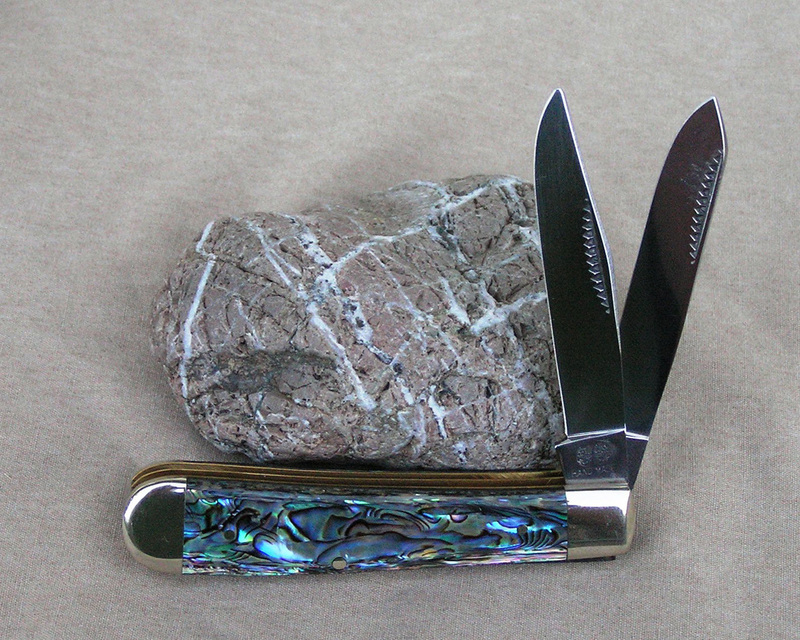 The handles Genuine Heart Abalone. This knife comes with a COA. 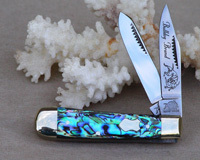 This knife does not have a shield and is 1 of 2 made, so very RARE. A special COA confirms this. I have another with a shield that is not as rare. This is a 3 3/8 inch closed 3 Blade Kentucky Derby Sowbelly. 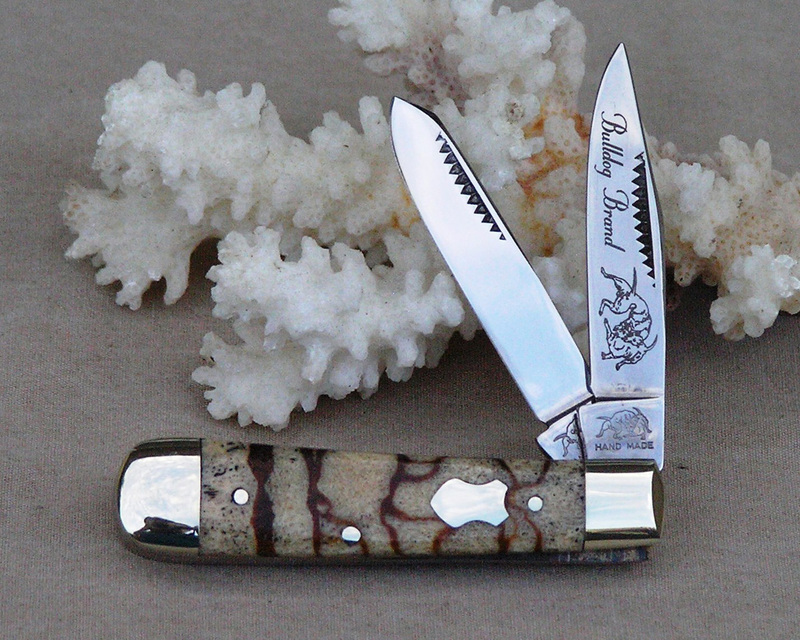 This knife features the discontinued Fighting Bulldog tang stamp. The master blade features the frosted Pit-Bull Trademark etch. The reverse of the master blade is engraved with ?Prototype?. The handles are Black Lip Pearl with no shield. This knife comes with a COA. This is a 3 3/8 inch closed 3 Blade Kentucky Derby Sowbelly. 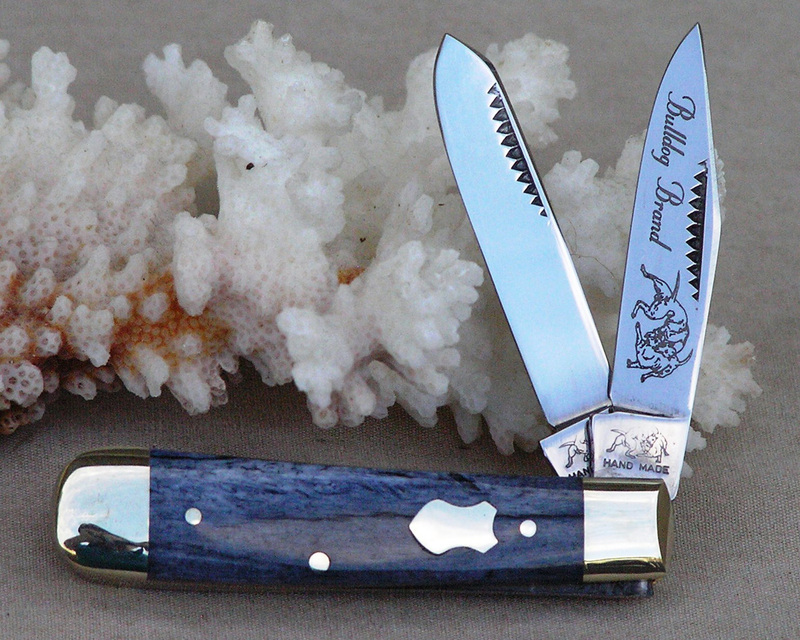 This knife features the discontinued Fighting Bulldog tang stamp. The master blade features the frosted Pit-Bull Trademark etch. The reverse of the master blade is engraved with ?Prototype?. 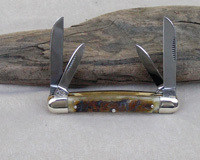 The handles are Brown Bark Mastodon Ivory with no shield. This knife comes with a COA. 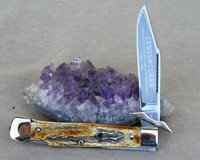 This is a 1 of 2 made, a very RARE knife and has a special COA to that fact. 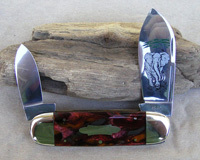 This knife is also pictured with the Mastodon Ivory knives. This is a 3 5/8 inch closed 4 blade Congress. 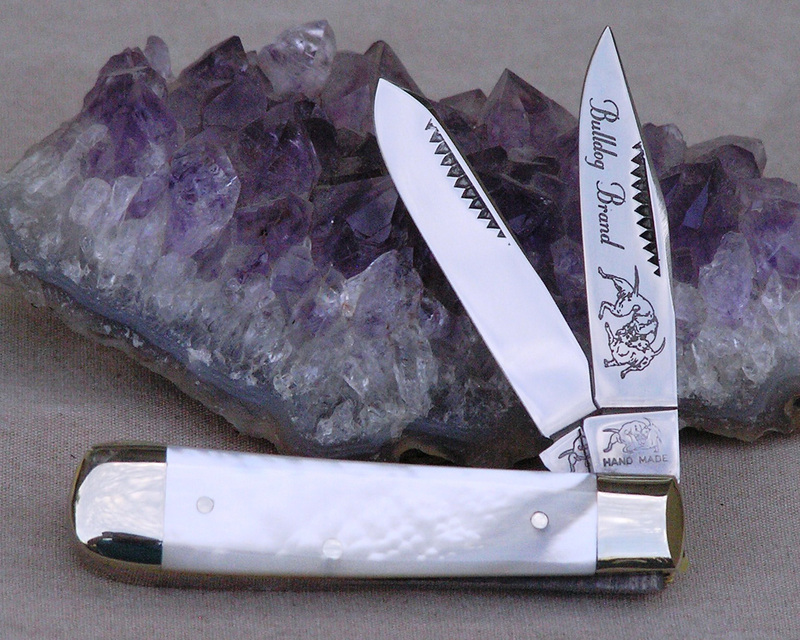 The master blade has the Pit Bull Trademark frosted etch and “Prototype” is engraved on the reverse side. The tang is stamped with the Fighting Dogs Stamp on all tangs. The handles are Himalayan Sheephorn with the bar Shield. This knife comes with a COA. This is a 3 5/8 inch closed 3 blade Square Bolster Stockman. 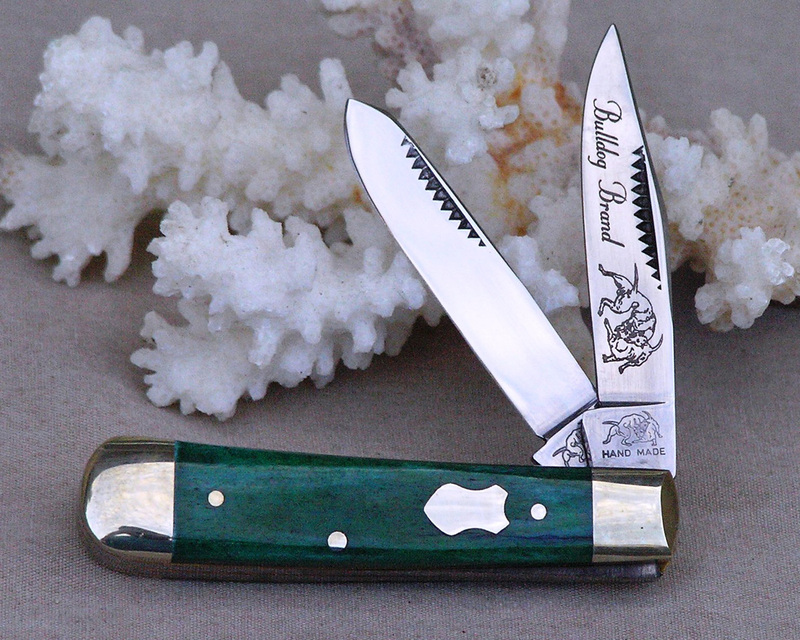 This knife features the discontinued Fighting Bulldog tang stamp. The master blade features the frosted Pit-Bull Trademark etch. The reverse of the master blade is engraved with “Prototype”. The handles are Black Lip Pearl with no shield. This knife comes with a COA. This is a 3 5/8 inch closed 3 blade Square Bolster Stockman. 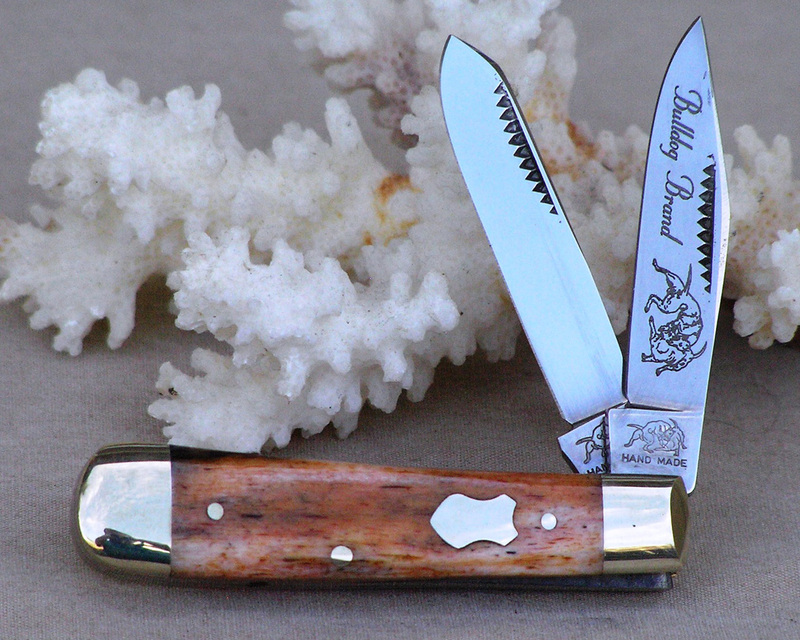 This knife features the discontinued Fighting Bulldog tang stamp. The master blade features the frosted Pit-Bull Trademark etch. The reverse of the master blade is engraved with ?Prototype?. The handles are Himalayan Sheephorn. This knife comes with a COA. This is a 3 7/8 inch closed 4 blade Congress. This knife has the discontinued Fighting Bulldog tang stamp. The master blade features the frosted Pit-Bull Trademark etch. The reverse of the master blade is engraved with “Prototype”. The handles are AAA1 Quality Pearl with no shield. This knife comes with a COA. This is a 3 7/8 inch closed 4 blade Congress. This knife that has the discontinued Fighting Bulldog tang stamp. The master blade features the frosted Pit-Bull Trademark etch. The reverse of the master blade is engraved with “Prototype”. The handles are Genuine Apple Coral with no shield. This knife comes with a COA. This is a 3 7/8 inch closed 3 Blade Cuttin’ Horse Sowbelly. 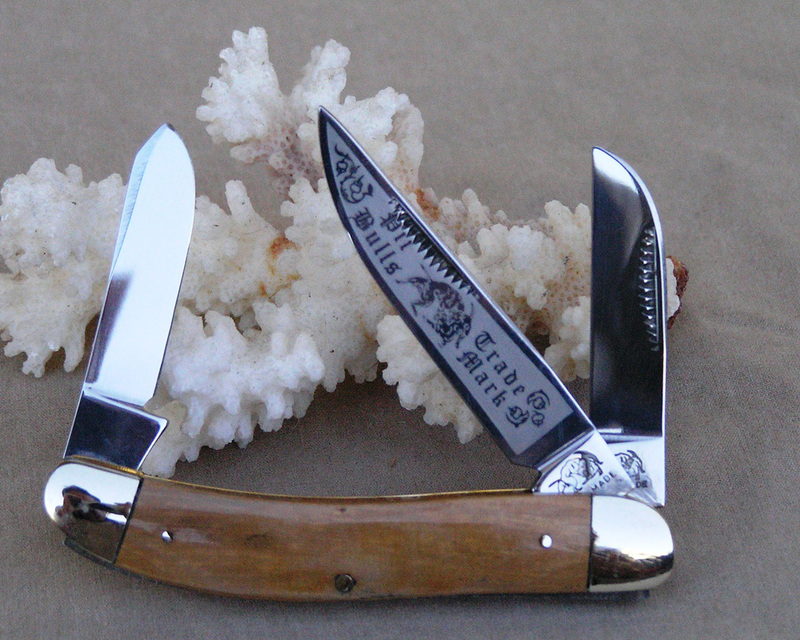 This knife features the discontinued Fighting Bulldog tang stamp. The master blade features the frosted Pit-Bull Trademark etch. The reverse of the master blade is engraved with ?Prototype?. The handles are Genuine Apple Coral with a Bomb Shield with fancy pinched Bolsters. This knife comes with a COA. This is a 3 7/8 inch closed 3 Blade Cuttin’ Horse Sowbelly. 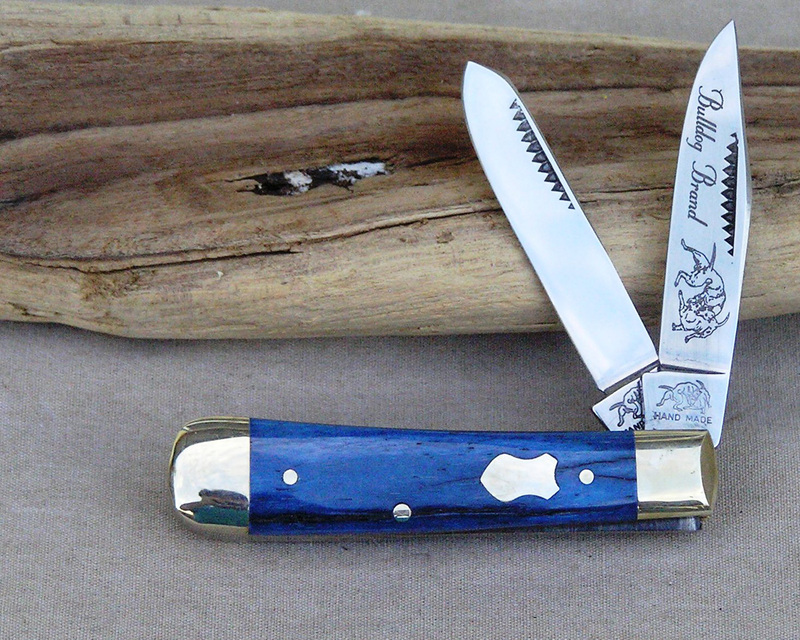 This knife features the discontinued Fighting Bulldog tang stamp. The master blade features the frosted Pit-Bull Trademark etch. The reverse of the master blade is engraved with “Prototype”. 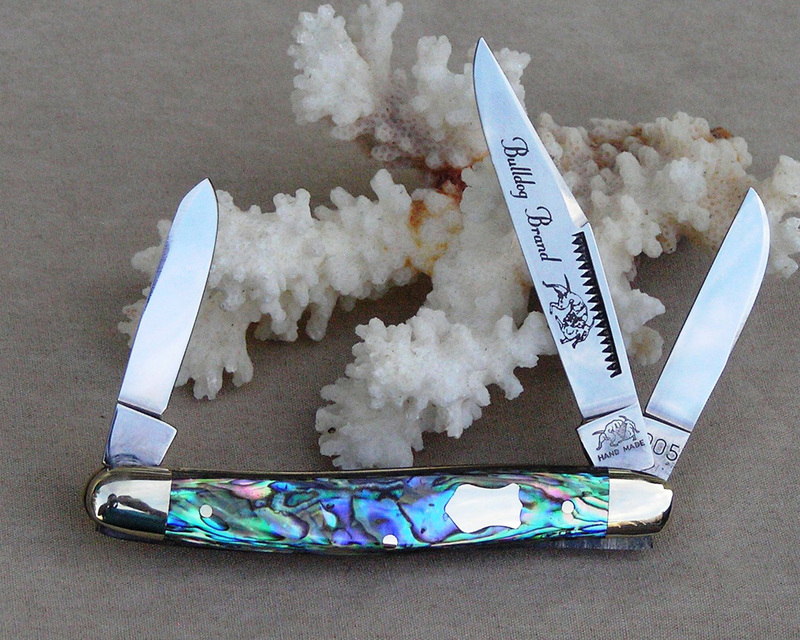 The handles are Genuine Heart Abalone with a Bomb Shield with fancy pinched Bolsters. This knife comes with a COA. This is a 3 7/8 inch closed 3 Blade Cuttin’ Horse Sowbelly. 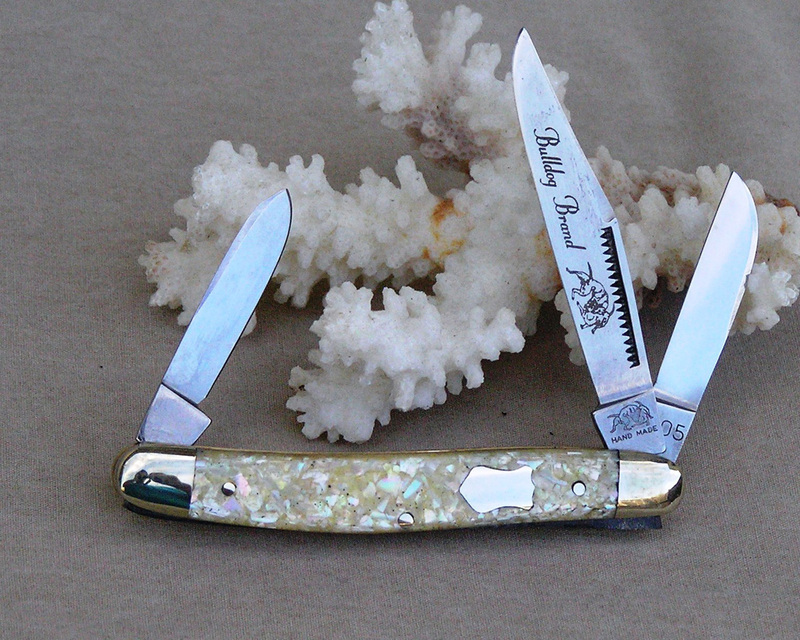 This knife features the discontinued Fighting Bulldog tang stamp. The master blade features the frosted Pit-Bull Trademark etch. The reverse of the master blade is engraved with “Prototype”. The handles are Genuine Himalayan Sheephorn with a Bomb Shield with fancy pinched Bolsters. This knife comes with a COA. This is a 4 1/4 inch closed 3 blade Stockman. 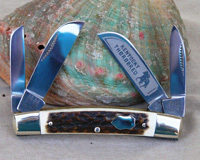 This knife has the discontinued Fighting Bulldog tang stamp. The master blade features the frosted Pit-Bull Trademark etch. The reverse of the master blade is engraved with “Prototype”. 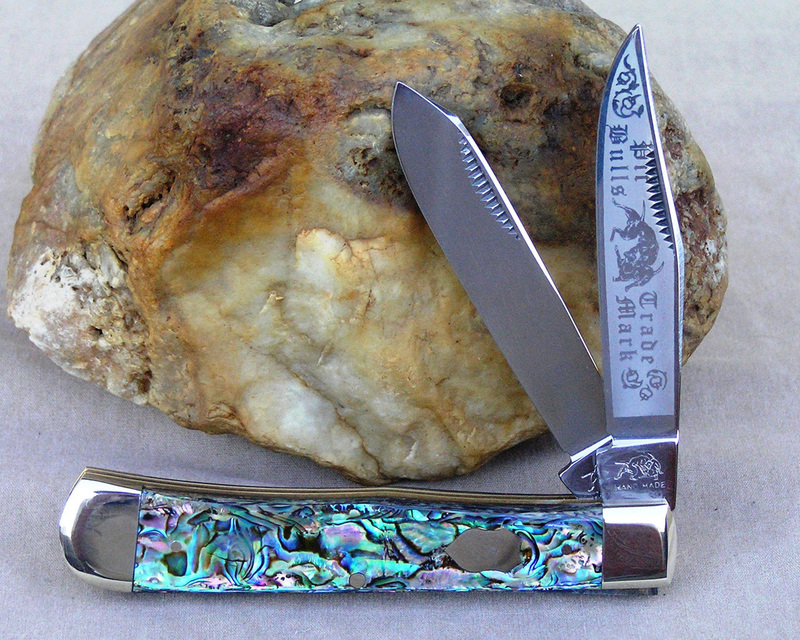 The handles are Genuine Heart Abalone with a Heraldic Shield. This knife comes with a COA. 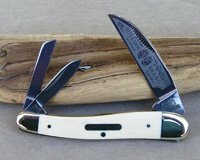 This is a 4 1/8 inch closed 2 Blade Trapper. This knife has the discontinued Fighting Bulldog tang stamp. The master blade features the frosted Pit-Bull Trademark etch. The reverse of the master blade is engraved with “Prototype”. The handles are Genuine Apple Coral with a Heraldic Shield. This knife comes with a COA. This is a 4 1/8 inch closed 2 Blade Trapper. This knife has the discontinued Fighting Bulldog tang stamp. The master blade features the frosted Pit-Bull Trademark etch. The reverse of the master blade is engraved with ?Prototype?. The handles are Genuine Heart Abalone with a Heraldic Shield. This knife comes with a COA. This is a 4 1/8 inch closed 2 Blade Trapper. This knife has the discontinued Fighting Bulldog tang stamp. The master blade features the frosted Pit-Bull Trademark etch. 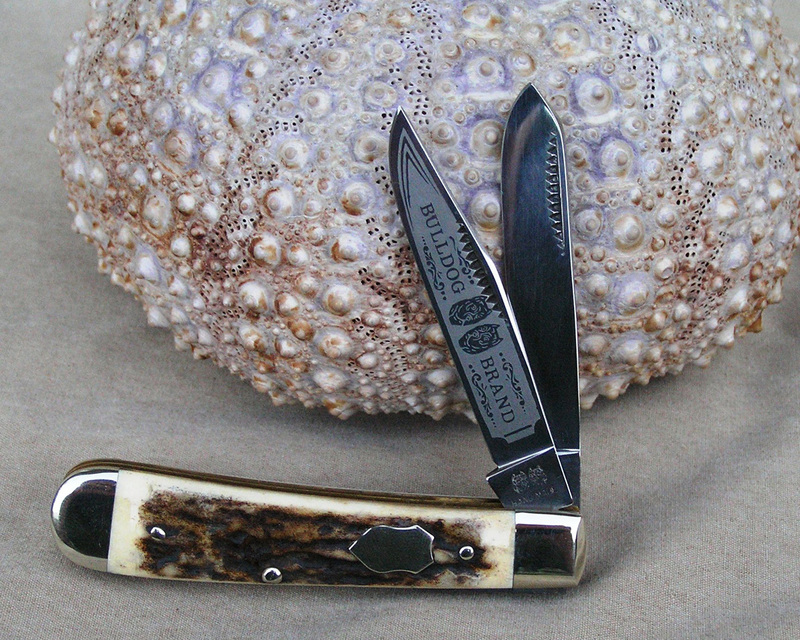 The handles are Interior Mastodon Ivory with a Heraldic Shield. This knife comes with a COA. 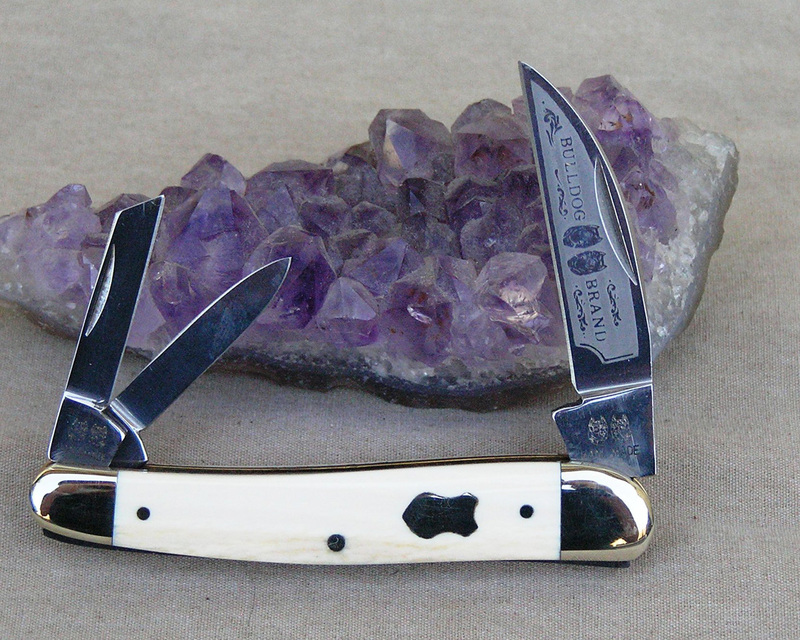 This knife is also pictured with the Mastodon Ivory knives. 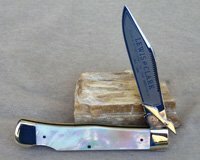 This is a 4 inch closed 3 blade Stockman. The master blade has the Pit Bull Trademark Frosted etch and “Prototype” is engraved on the reverse side. The tang is stamped with the Fighting Dogs Tang Stamp on all tangs. The handles Himalayan Sheephorn with round bolsters and the Banner Shield. This is a 4 inch closed 2 Blade Muskrat. This knife has the discontinued Fighting Bulldog tang stamp. The master blade features the frosted Pit-Bull Trademark etch. The reverse of the master blade is engraved with ?Prototype 1 of 7?. The handles are Black Lip Pearl with no shield. This knife comes with a COA. A RARE knife with only 7 made. 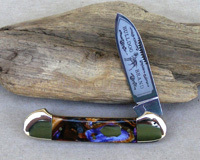 New in 2005 from Bulldog Brand Knives, this is a 2 3/4 inch closed 2 blade Baby Bullet Trapper. This has Bark Mammoth Ivory handles with a crest shield. The master clip blade is black laser etched on the front with the Fighting Bulldog logo, and “Bulldog Brand”. The back is engraved with “Prototype”. All tangs have the Fighting Bulldogs Stamp. The reverse of 1 tang has 2005 to prevent confusion with other model years. There was only 10 of these prototype models made, 10 each of 10 different handle materials. This collection has the whole set. This is 1 of 10. This is listed in the Mastodon Ivory Knives also. 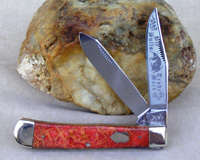 New in 2005 from Bulldog Brand Knives, this is a 3 3/8 inch closed 3 blade Stockman. This has a Bark Mastodon Ivory handle with a crest shield. The master clip blade is black laser etched on the front with the Fighting Bulldog logo, and “Bulldog Brand”. The back is engraved with “Prototype”. All tangs have the Fighting Bulldogs Stamp. The reverse of 1 tang has 2005 to prevent confusion with other model years. There was only 10 of these prototype models made, 10 each of 10 different handle materials. This collection has the whole set. This is 1 of 10. This is listed in the Mastodon Ivory Knives also. New in 2005 from Bulldog Brand Knives, this is a 4 1/2 inch closed Toothpick. This has a Bark Mammoth Ivory handle with a crest shield. The single master blade is black laser etched on the front with the Fighting Bulldog logo, and “Bulldog Brand”. The back is engraved with “Prototype”. The tang has the Fighting Bulldogs Stamp. The reverse of the tang has 2005 to prevent confusion with other model years. There was only 10 of these prototype models made, 10 each of 10 different handle materials. This is 1 of 10. 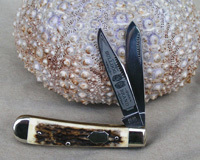 This is listed in the Mastodon Ivory Knives also. 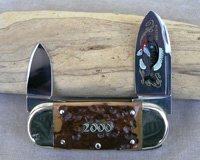 New in 2005 from Bulldog Brand Knives, this is a 2 3/4 inch closed 2 blade Baby Bullet Trapper. 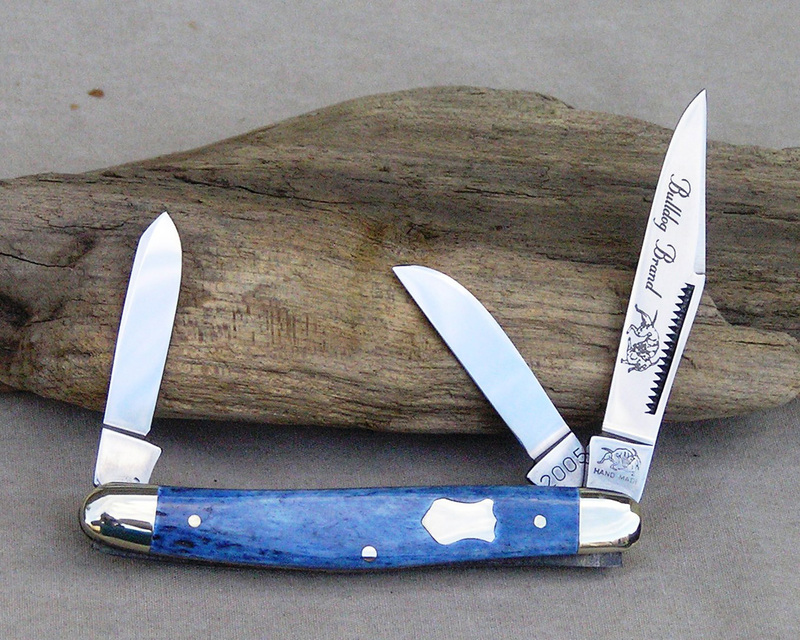 This has Blue Giraffe Bone handles with a crest shield. The master clip blade is black laser etched on the front with the Fighting Bulldog logo, and “Bulldog Brand”. The back is engraved with “Prototype”. All tangs have the Fighting Bulldogs Stamp. The reverse of 1 tang has 2005 to prevent confusion with other model years. There was only 10 of these prototype models made, 10 each of 10 different handle materials. This collection has the whole set. This is 1 of 10. New in 2005 from Bulldog Brand Knives, this is a 3 3/8 inch closed 3 blade Stockman. This has Blue Giraffe Bone handles with a crest shield. The master clip blade is black laser etched on the front with the Fighting Bulldog logo, and “Bulldog Brand”. The back is engraved with “Prototype”. All tangs have the Fighting Bulldogs Stamp. The reverse of 1 tang has 2005 to prevent confusion with other model years. There was only 10 of these prototype models made, 10 each of 10 different handle materials. This collection has the whole set. This is 1 of 10. 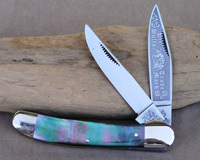 New in 2005 from Bulldog Brand Knives, this is a 2 3/4 inch closed 2 blade Baby Bullet Trapper. This has Brown Giraffe Bone handles with a crest shield. The master clip blade is black laser etched on the front with the Fighting Bulldog logo, and “Bulldog Brand”. The back is engraved with “Prototype”. All tangs have the Fighting Bulldogs Stamp. The reverse of 1 tang has 2005 to prevent confusion with other model years. There was only 10 of these prototype models made, 10 each of 10 different handle materials. This collection has the whole set. This is 1 of 10. 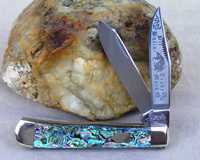 New in 2005 from Bulldog Brand Knives, this is a 3 3/8 inch closed 3 blade Stockman. This has Brown Giraffe Bone handles with a crest shield. The master clip blade is black laser etched on the front with the Fighting Bulldog logo, and “Bulldog Brand”. The back is engraved with “Prototype”. All tangs have the Fighting Bulldogs Stamp. The reverse of 1 tang has 2005 to prevent confusion with other model years. There was only 10 of these prototype models made, 10 each of 10 different handle materials. This collection has the whole set. This is 1 of 10. 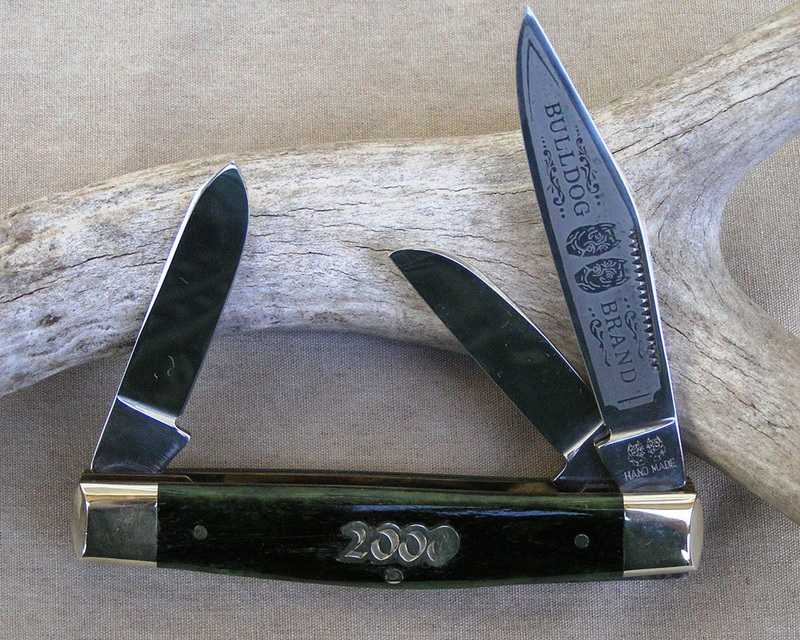 New in 2005 from Bulldog Brand Knives, this is a 2 3/4 inch closed 2 blade Baby Bullet Trapper. 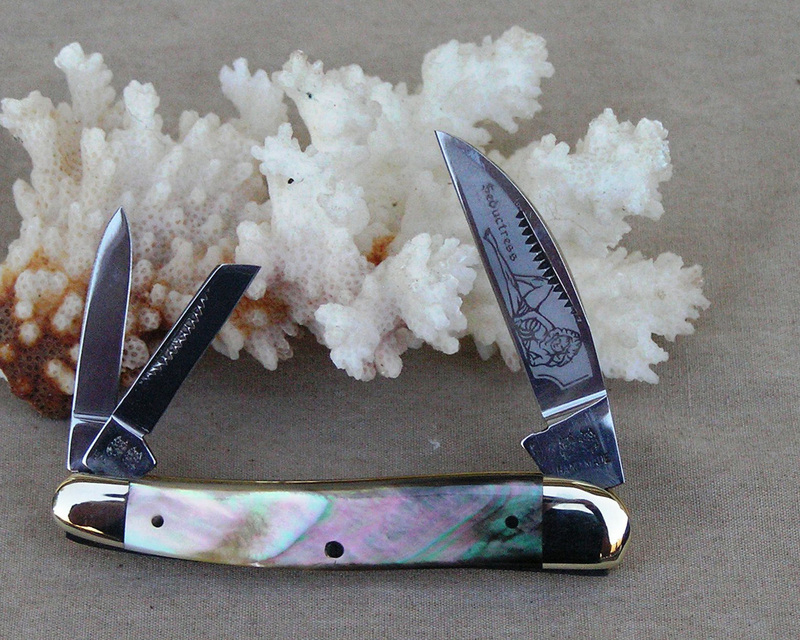 This has Chip Abalone handles with a crest shield. The master clip blade is black laser etched on the front with the Fighting Bulldog logo, and “Bulldog Brand”. The back is engraved with “Prototype”. All tangs have the Fighting Bulldogs Stamp. The reverse of 1 tang has 2005 to prevent confusion with other model years. There was only 10 of these prototype models made, 10 each of 10 different handle materials. This collection has the whole set. This is 1 of 10. New in 2005 from Bulldog Brand Knives, this is a 3 3/8 inch closed 3 blade Stockman. This has a Chipped Abalone handle with a crest shield. The master clip blade is black laser etched on the front with the Fighting Bulldog logo, and “Bulldog Brand”. The back is engraved with “Prototype”. All tangs have the Fighting Bulldogs Stamp. The reverse of 1 tang has 2005 to prevent confusion with other model years. 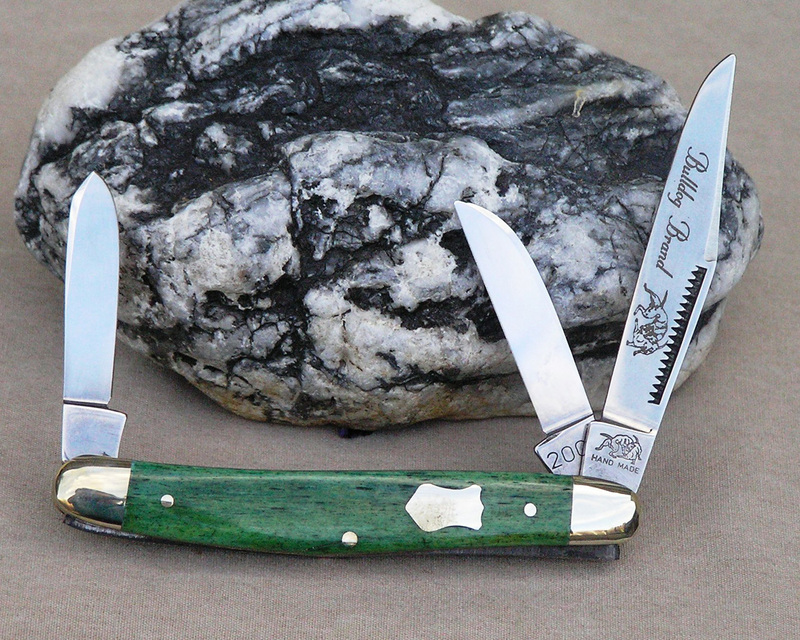 There was only 10 of these prototype models made, 10 each of 10 different handle materials. This collection has the whole set. This is 1 of 10. New in 2005 from Bulldog Brand Knives, this is a 4 1/2 inch closed Toothpick. 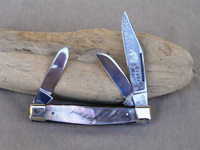 This has a Chipped Abalone handle with a crest shield. The single master blade is black laser etched on the front with the Fighting Bulldog logo, and “Bulldog Brand”. The back is engraved with “Prototype”. The tang has the Fighting Bulldogs Stamp. The reverse of the tang has 2005 to prevent confusion with other model years. There was only 10 of these prototype models made, 10 each of 10 different handle materials. This is 1 of 10. 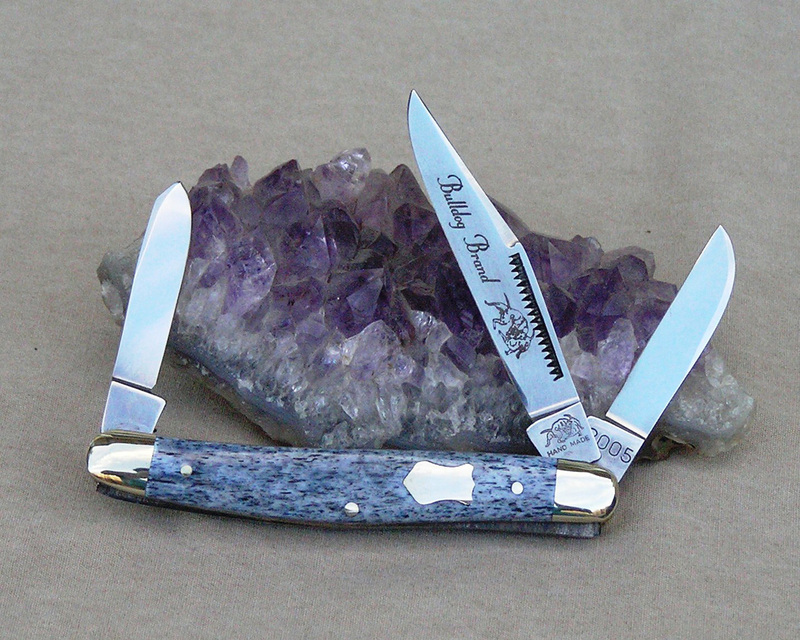 New in 2005 from Bulldog Brand Knives, this is a 4 3/4 inch closed 2 blade Doctors Knife. 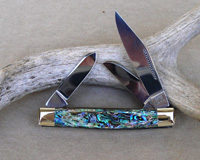 This has Chipped Abalone handles with a crest shield. 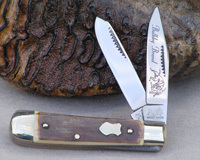 The Spear blade is etched on the front, with the Fighting Bulldog logo, and reads “Bulldog Brand”. The back is engraved with “Prototype”. The spear blade tang has the Fighting Bulldogs Stamp. The spatula tang has the Fighting Bulldogs Stamp and the reverse of the tang has 2005 to prevent confusion with other model years. There was only 10 of these prototype models made, 10 each of 10 different handle materials. This is 1 of 10. 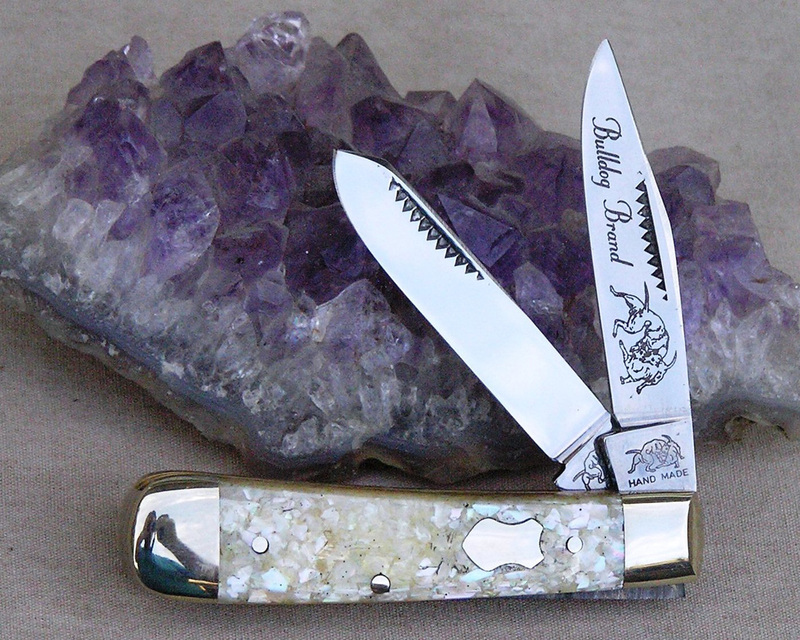 New in 2005 from Bulldog Brand Knives, this is a 2 3/4 inch closed 2 blade Baby Bullet Trapper. 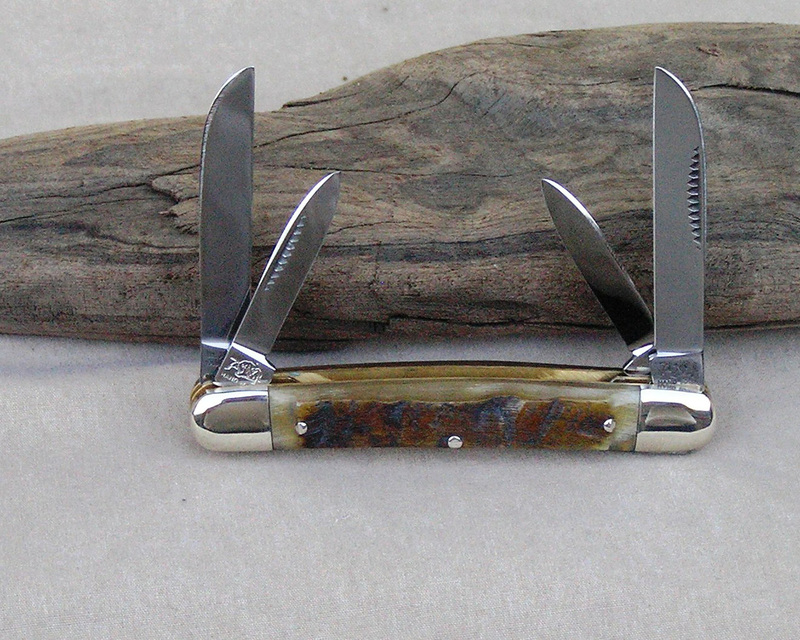 This has Gray Giraffe Bone handles with a crest shield. The master clip blade is black laser etched on the front with the Fighting Bulldog logo, and “Bulldog Brand”. The back is engraved with “Prototype”. All tangs have the Fighting Bulldogs Stamp. The reverse of 1 tang has 2005 to prevent confusion with other model years. There was only 10 of these prototype models made, 10 each of 10 different handle materials. This collection has the whole set. This is 1 of 10. 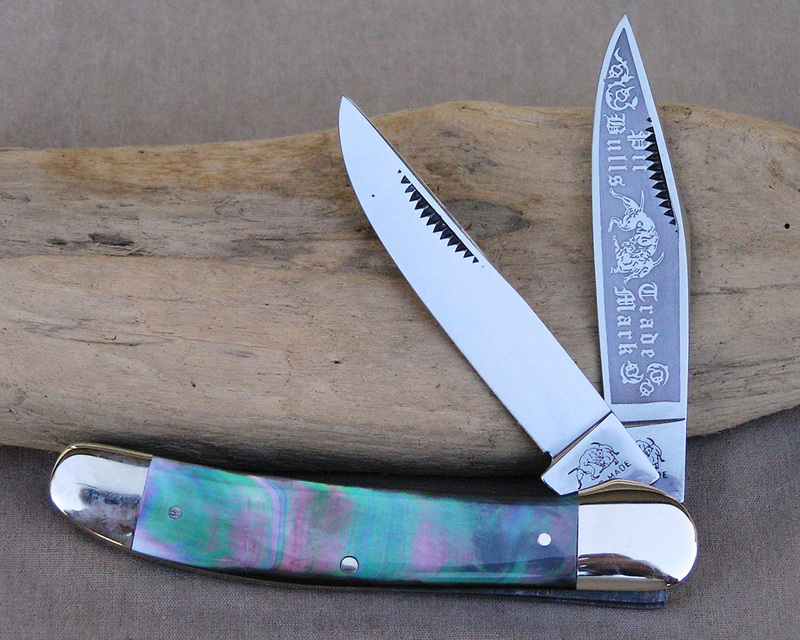 New in 2005 from Bulldog Brand Knives, this is a 3 3/8 inch closed 3 blade Stockman. This has Gray Giraffe Bone handles with a crest shield. The master clip blade is black laser etched on the front with the Fighting Bulldog logo, and “Bulldog Brand”. The back is engraved with “Prototype”. All tangs have the Fighting Bulldogs Stamp. The reverse of 1 tang has 2005 to prevent confusion with other model years. There was only 10 of these prototype models made, 10 each of 10 different handle materials. This collection has the whole set. This is 1 of 10. New in 2005 from Bulldog Brand Knives, this is a 2 3/4 inch closed 2 blade Baby Bullet Trapper. This has Green Giraffe Bone handles with a crest shield. The master clip blade is black laser etched on the front with the Fighting Bulldog logo, and “Bulldog Brand”. The back is engraved with “Prototype”. All tangs have the Fighting Bulldogs Stamp. The reverse of 1 tang has 2005 to prevent confusion with other model years. There was only 10 of these prototype models made, 10 each of 10 different handle materials. This collection has the whole set. This is 1 of 10. 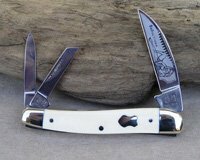 New in 2005 from Bulldog Brand Knives, this is a 3 3/8 inch closed 3 blade Stockman. This has Green Giraffe Bone handles with a crest shield. The master clip blade is black laser etched on the front with the Fighting Bulldog logo, and “Bulldog Brand”. The back is engraved with “Prototype”. All tangs have the Fighting Bulldogs Stamp. The reverse of 1 tang has 2005 to prevent confusion with other model years. There was only 10 of these prototype models made, 10 each of 10 different handle materials. This collection has the whole set. This is 1 of 10. 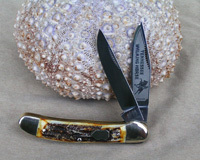 New in 2005 from Bulldog Brand Knives, this is a 2 3/4 inch closed 2 blade Baby Bullet Trapper. 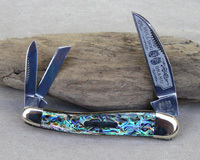 This has Genuine Heart Abalone handles with a crest shield. The master clip blade is black laser etched on the front with the Fighting Bulldog logo, and “Bulldog Brand”. The back is engraved with “Prototype”. All tangs have the Fighting Bulldogs Stamp. The reverse of 1 tang has 2005 to prevent confusion with other model years. There was only 10 of these prototype models made, 10 each of 10 different handle materials. This collection has the whole set. This is 1 of 10. New in 2005 from Bulldog Brand Knives, this is a 3 3/8 inch closed 3 blade Stockman. 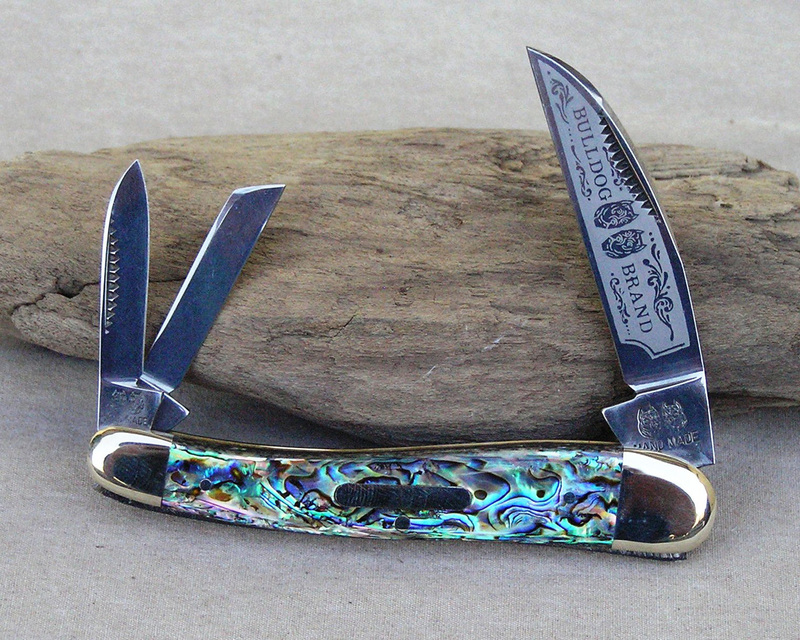 This has Genuine Heart Abalone handles with a crest shield. The master clip blade is black laser etched on the front with the Fighting Bulldog logo, and “Bulldog Brand”. The back is engraved with “Prototype”. All tangs have the Fighting Bulldogs Stamp. The reverse of 1 tang has 2005 to prevent confusion with other model years. There was only 10 of these prototype models made, 10 each of 10 different handle materials. This collection has the whole set. This is 1 of 10. 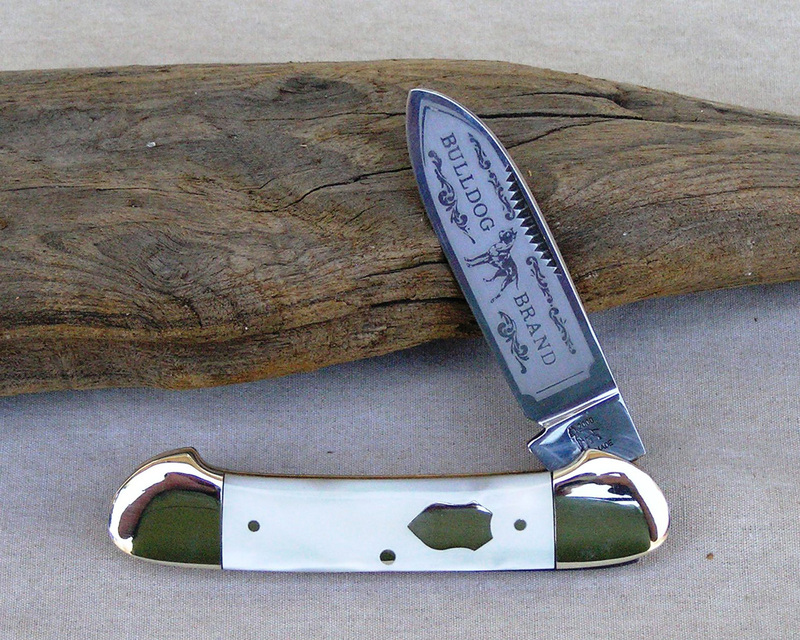 New in 2005 from Bulldog Brand Knives, this is a 2 3/4 inch closed 2 blade Baby Bullet Trapper. This has Interior Mammoth Ivory handles with a crest shield. The master clip blade is black laser etched on the front with the Fighting Bulldog logo, and “Bulldog Brand”. The back is engraved with “Prototype”. All tangs have the Fighting Bulldogs Stamp. The reverse of 1 tang has 2005 to prevent confusion with other model years. There was only 10 of these prototype models made, 10 each of 10 different handle materials. This collection has the whole set. This is 1 of 10. 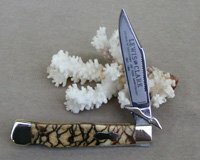 This is listed in the Mastodon Ivory Knives also. New in 2005 from Bulldog Brand Knives, this is a 3 3/8 inch closed 3 blade Stockman. 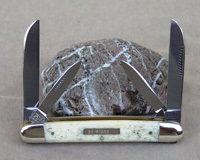 This has Interior Mastodon Ivory handles with a crest shield. The master clip blade is black laser etched on the front with the Fighting Bulldog logo, and “Bulldog Brand”. The back is engraved with “Prototype”. All tangs have the Fighting Bulldogs Stamp. The reverse of 1 tang has 2005 to prevent confusion with other model years. There was only 10 of these prototype models made, 10 each of 10 different handle materials. This collection has the whole set. This is 1 of 10. This is listed in the Mastodon Ivory Knives also. New in 2005 from Bulldog Brand Knives, this is a 4 1/2 inch closed Toothpick. This has a Interior Mammoth Ivory handle with a crest shield. The single master blade is black laser etched on the front with the Fighting Bulldog logo, and “Bulldog Brand”. The back is engraved with “Prototype”. The tang has the Fighting Bulldogs Stamp. The reverse of the tang has 2005 to prevent confusion with other model years. There was only 10 of these prototype models made, 10 each of 10 different handle materials. This is 1 of 10. 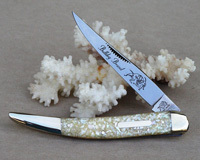 This is listed in the Mastodon Ivory Knives also. 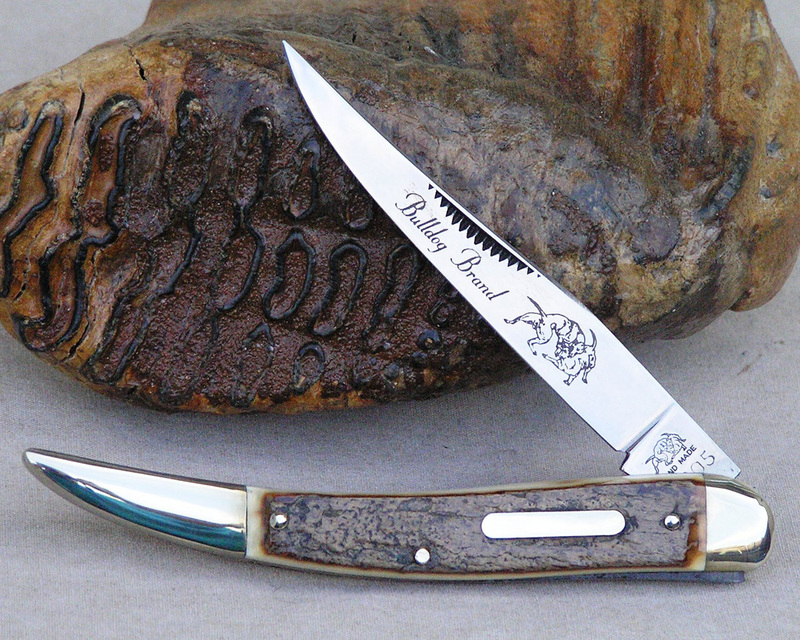 New in 2005 from Bulldog Brand Knives, this is a 2 3/4 inch closed 2 blade Baby Bullet Trapper. This has Pearl handles with a crest shield. The master clip blade is black laser etched on the front with the Fighting Bulldog logo, and “Bulldog Brand”. The back is engraved with “Prototype”. All tangs have the Fighting Bulldogs Stamp. The reverse of 1 tang has 2005 to prevent confusion with other model years. There was only 10 of these prototype models made, 10 each of 10 different handle materials. This collection has the whole set. This is 1 of 10. 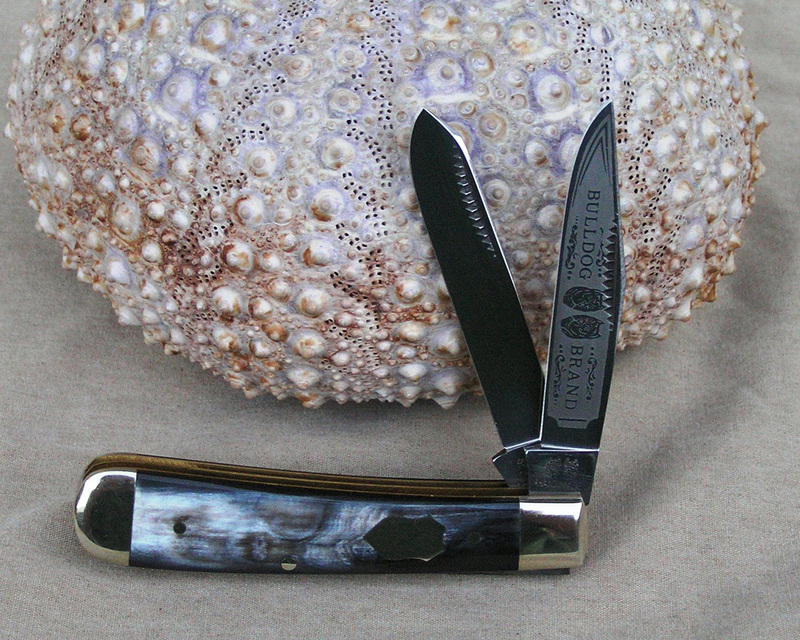 New in 2005 from Bulldog Brand Knives, this is a 3 3/8 inch closed 3 blade Stockman. This has Genuine Pearl handles with a crest shield. The master clip blade is black laser etched on the front with the Fighting Bulldog logo, and “Bulldog Brand”. The back is engraved with “Prototype”. All tangs have the Fighting Bulldogs Stamp. The reverse of 1 tang has 2005 to prevent confusion with other model years. There was only 10 of these prototype models made, 10 each of 10 different handle materials. This collection has the whole set. This is 1 of 10. New in 2005 from Bulldog Brand Knives, this is a 3 3/8 inch closed 3 blade Stockman. 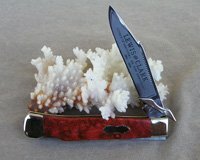 This has Genuine Tiger Coral handles with a crest shield. The master clip blade is black laser etched on the front with the Fighting Bulldog logo, and “Bulldog Brand”. The back is engraved with “Prototype”. All tangs have the Fighting Bulldogs Stamp. The reverse of 1 tang has 2005 to prevent confusion with other model years. There was only 10 of these prototype models made, 10 each of 10 different handle materials. This collection has the whole set. This is 1 of 10. New in 2005 from Bulldog Brand Knives, this is a 2 3/4 inch closed 2 blade Baby Bullet Trapper. 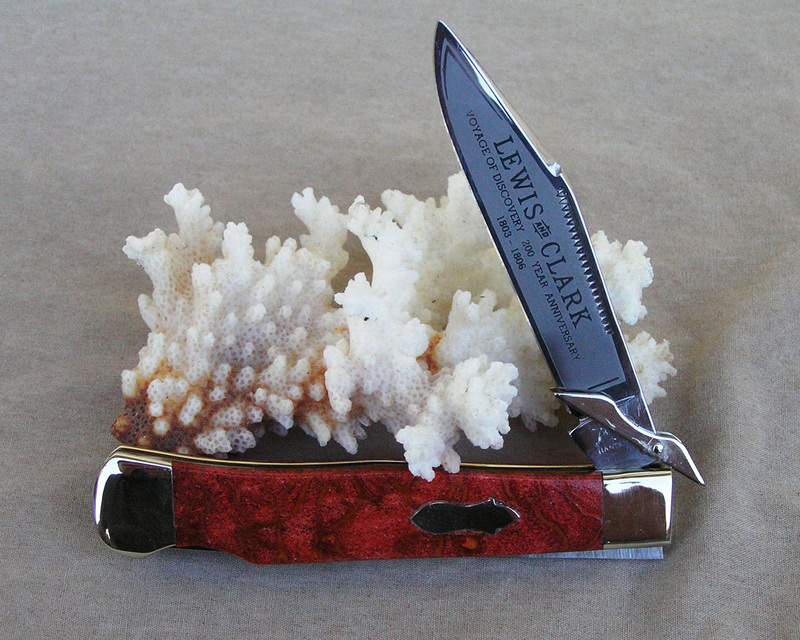 This has Tiger Coral handles with a crest shield. The master clip blade is black laser etched on the front with the Fighting Bulldog logo, and “Bulldog Brand”. The back is engraved with “Prototype”. All tangs have the Fighting Bulldogs Stamp. The reverse of 1 tang has 2005 to prevent confusion with other model years. There was only 10 of these prototype models made, 10 each of 10 different handle materials. This collection has the whole set. This is 1 of 10. This is a 4 inch closed Lewis and Clark Swing Guard Lockback. 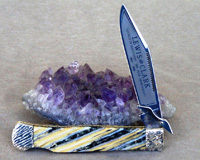 The Single Lockback blade has the Lewis and Clark 200 Year Anniversary etch and features a swinging guard. The tang is stamped with the Fighting Pit-Bulls. 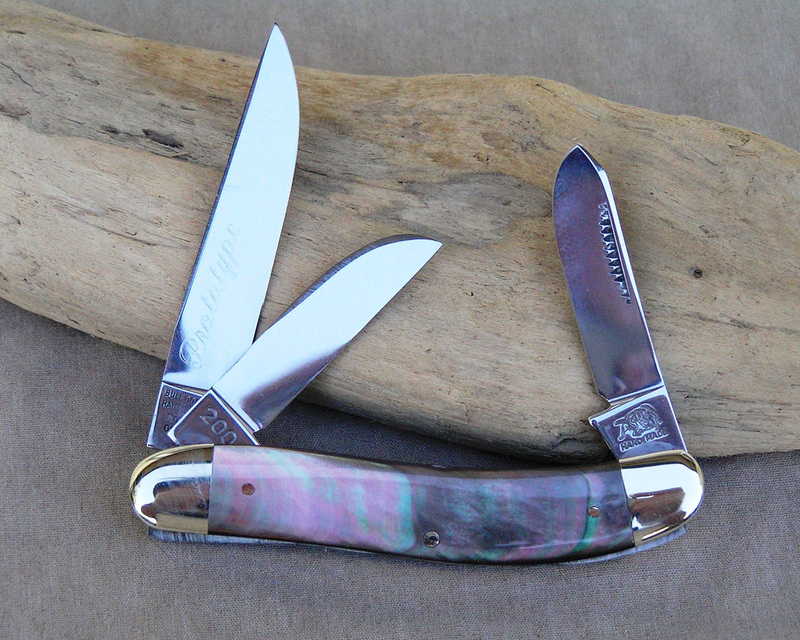 The handles are AAA1 Quality Pearl that is full of color and fire with No Shield. PRODUCTION. This is a 4 inch closed Lewis and Clark Swing Guard Lockback. The Single Lockback blade has the Lewis and Clark 200 Year Anniversary etch with Prototype engraved on the reverse and features a swinging guard. The tang is stamped with the Fighting Pit-Bulls. The handles are AAA1 Quality Pearl that is full of color and fire with No Shield. This knife came with a COA signed by Jim Parker. 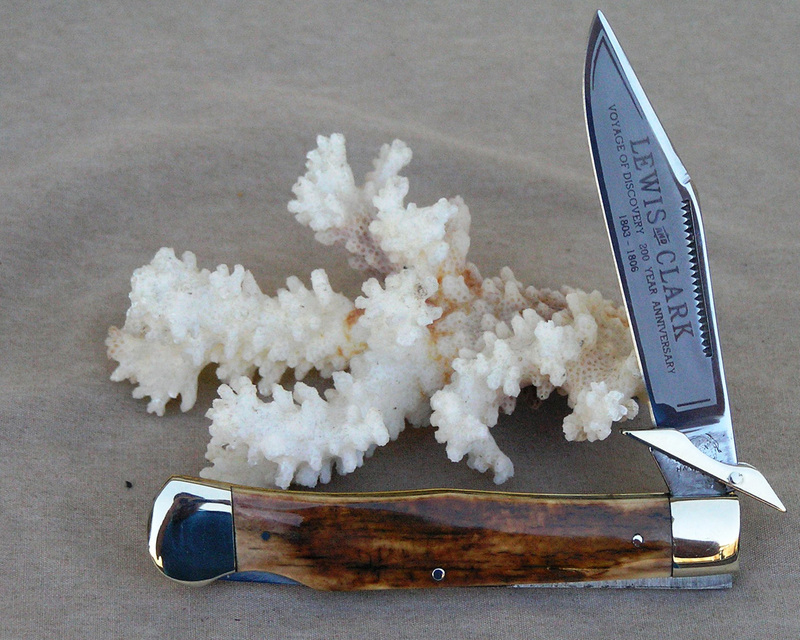 This is a 4 inch closed Lewis and Clark Swing Guard Lockback. 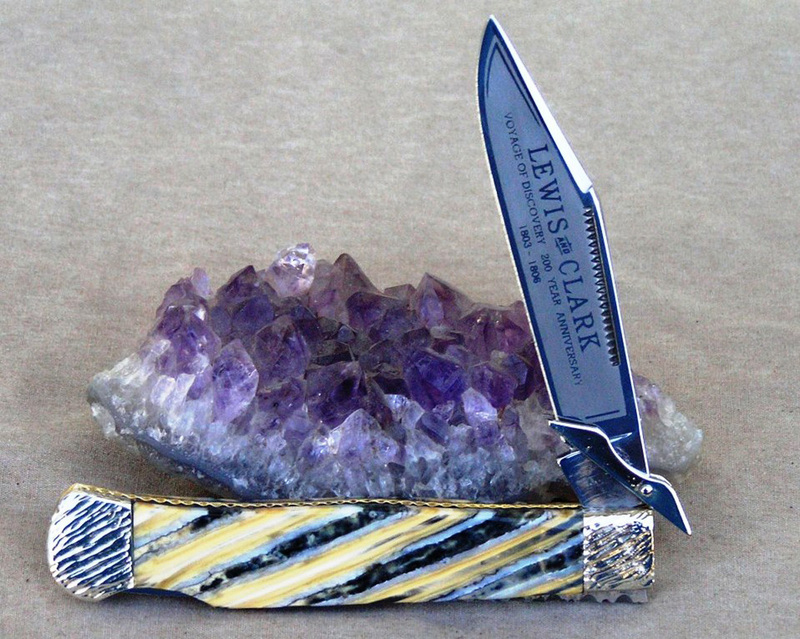 The Single Lockback blade has the Lewis and Clark 200 Year Anniversary etch with Prototype engraved on the reverse and features a swinging guard. The tang is stamped with the Fighting Pit-Bulls. This knife has No Shield. The handles are Bark Mastodon Ivory which is from the outside of the tusk. This knife came with a COA signed by Jim Parker. 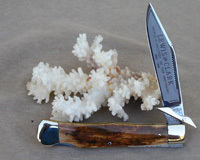 This Knife is also shown in Mastodon Ivory knives. This is a 4 inch closed Lewis and Clark Swing Guard Lockback. 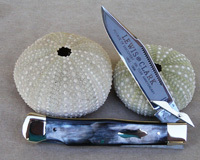 The Single Lockback blade has the Lewis and Clark 200 Year Anniversary etch with Prototype engraved on the reverse and features a swinging guard. The tang is stamped with the Fighting Pit-Bulls. 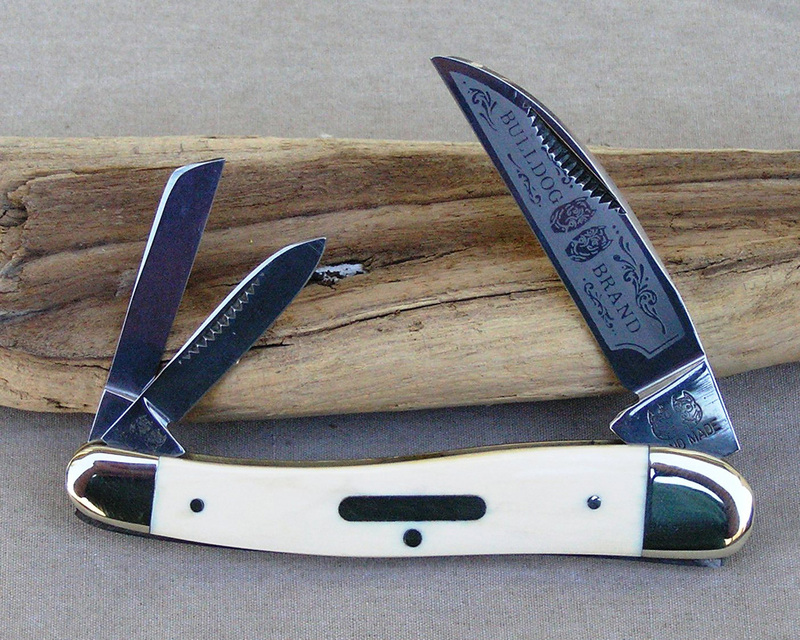 The handles are Buffalo Horn with a Bomb Shield. This knife came with a COA signed by Jim Parker. This is a 4 inch closed Lewis and Clark Swing Guard Lockback. 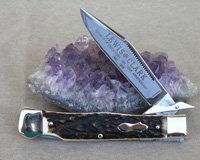 The Single Lockback blade has the Lewis and Clark 200 Year Anniversary etch with Prototype engraved on the reverse and features a swinging guard. The tang is stamped with the Fighting Pit-Bulls. 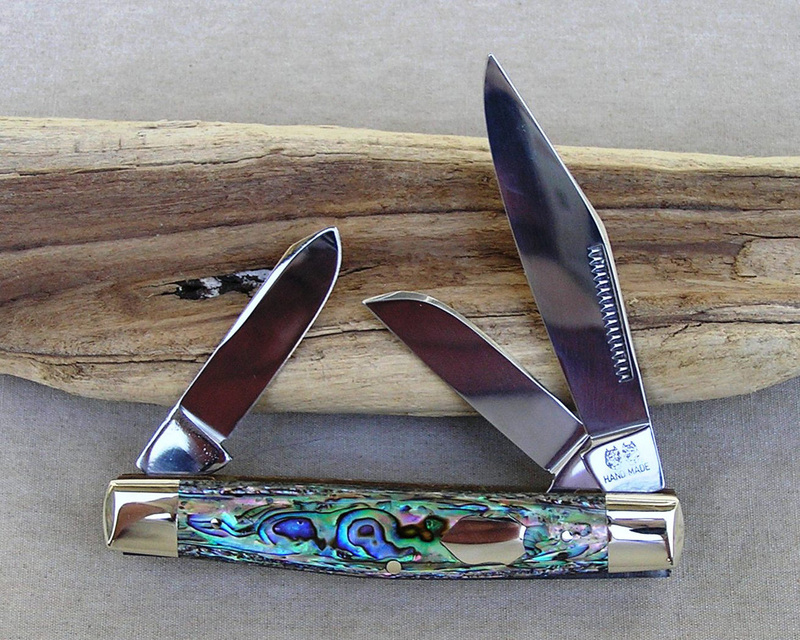 The handles are Gold Lip Pearl that is full of color and fire with No Shield. This knife came with a COA signed by Jim Parker. This is a 4 inch closed Lewis and Clark Swing Guard Lockback. 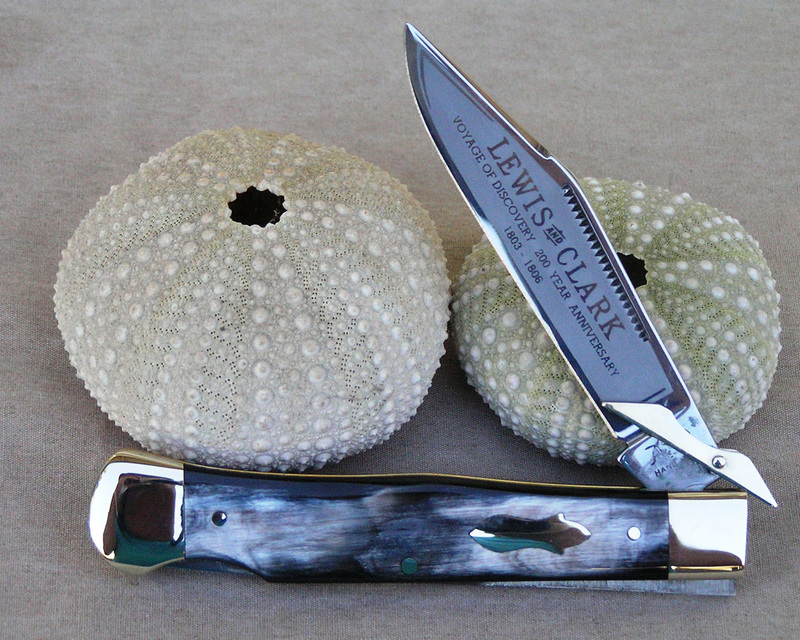 The Single Lockback blade has the Lewis and Clark 200 Year Anniversary etch and features a swinging guard. The tang is stamped with the Fighting Pit-Bulls. The handles are Hummingbird Feather with the Bomb Shield. This is a PRODUCTION knife. 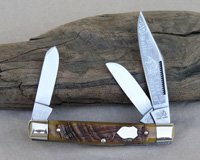 HAND MADE BULLDOG BRAND KNIFE! 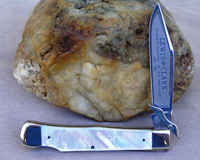 This well made Lewis and Clark Swing Guard Lockback is made of mirror polished drop forged steel. This knife is 4 inches closed. 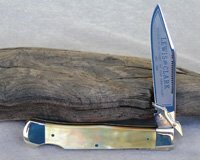 The Single Lockback blade has the Lewis and Clark 200 Year Anniversary etch and features a swinging guard. The tang is stamped with the Fighting Pit-Bulls. This knife has the Bomb Shield. 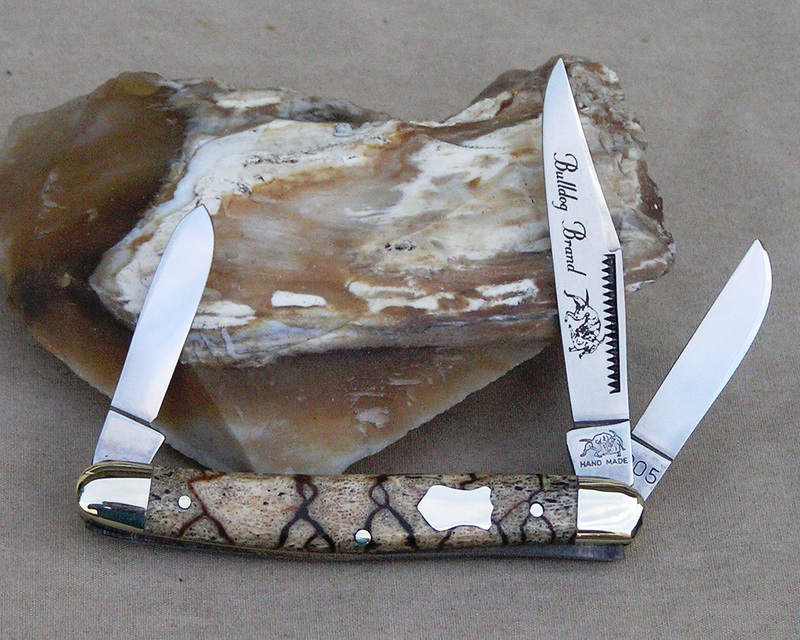 The handles are beautiful matched Interior Mastodon Ivory which is from the inside of the tusk. This knife is Hand made in Solingen, Germany. 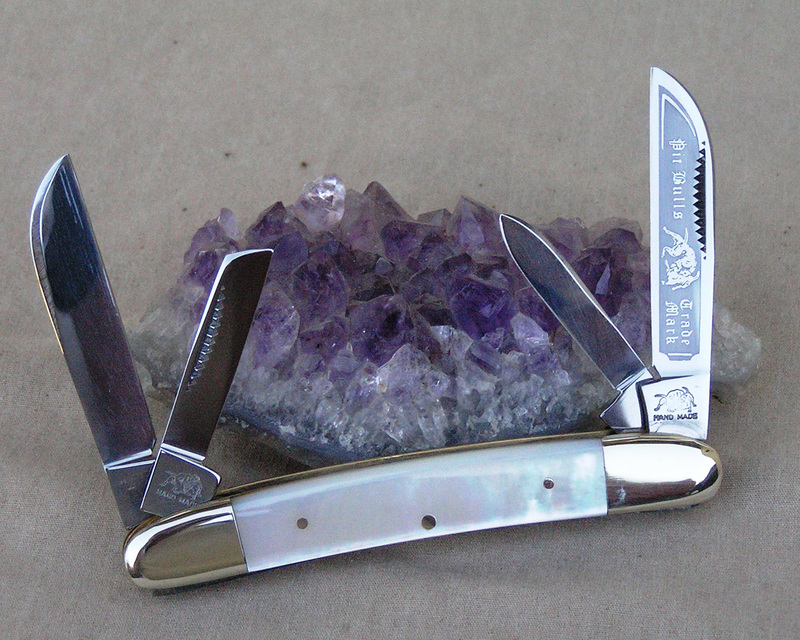 It?s in perfect condition (Pristine Mint) and has never been sharpened, carried, or used. This knife is a PRODUCTION knife. 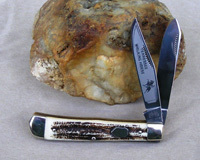 This Knife is also shown in Mastodon Ivory knives. This is a 4 inch closed Lewis and Clark Swing Guard Lockback. 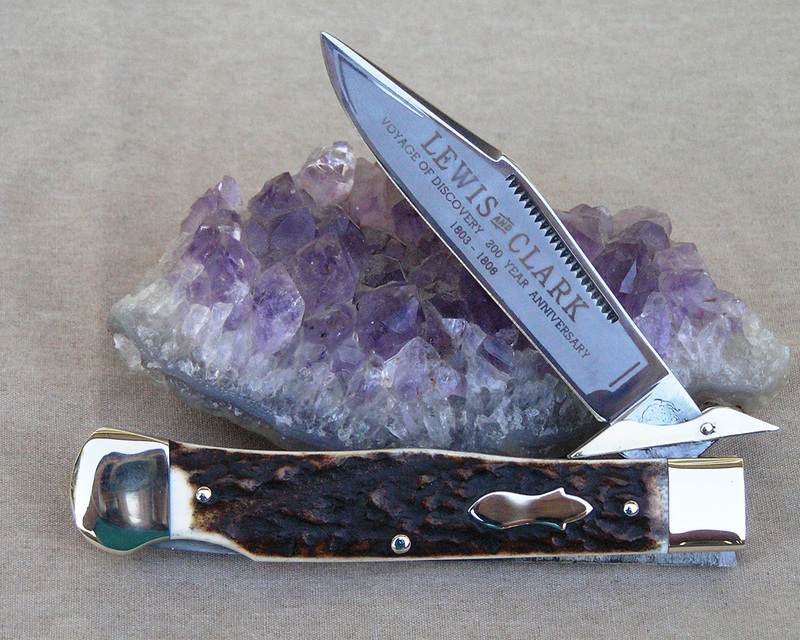 The Single Lockback blade has the Lewis and Clark 200 Year Anniversary etch with Prototype engraved on the reverse and features a swinging guard. The tang is stamped with the Fighting Pit-Bulls. This knife has the Bomb Shield. 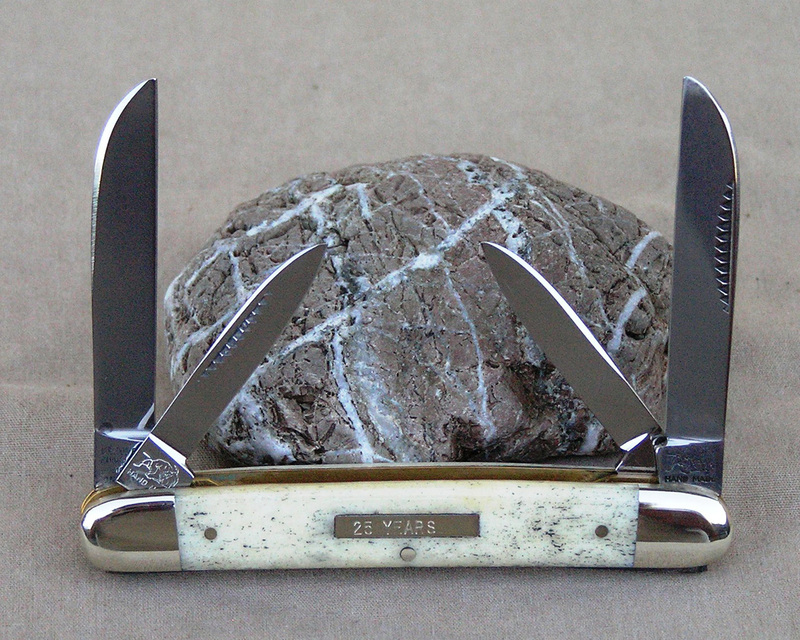 The handles are Interior Mastodon Ivory which is from the inside of the tusk. This knife came with a COA signed by Jim Parker. 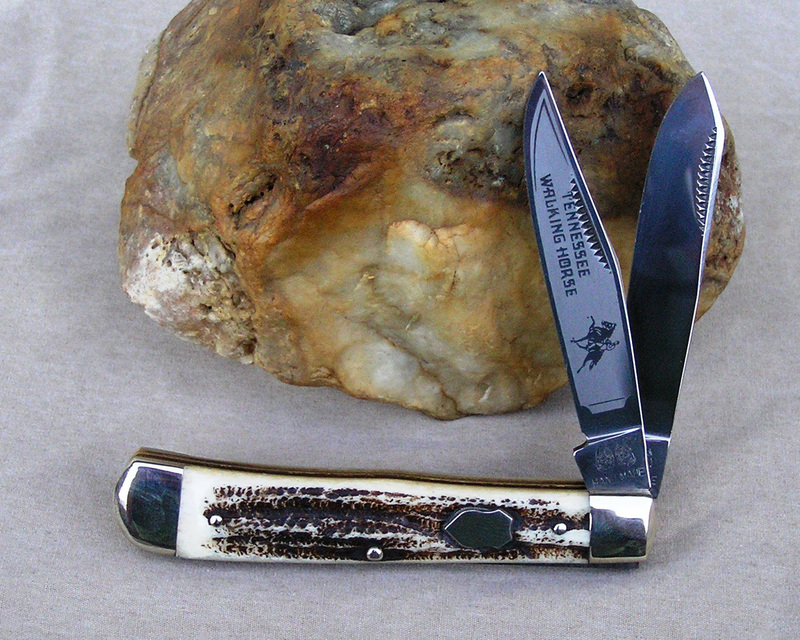 This Knife is also shown in Mastodon Ivory knives. 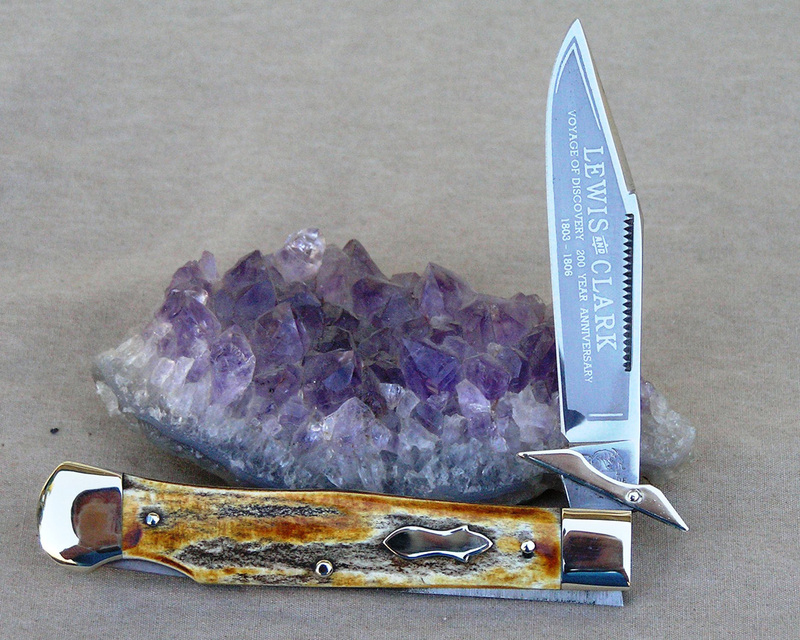 CUSTOMIZED by Jeff Jones of Jones Cutlery. This is a 4 inch closed Lewis and Clark Swing Guard Lockback. 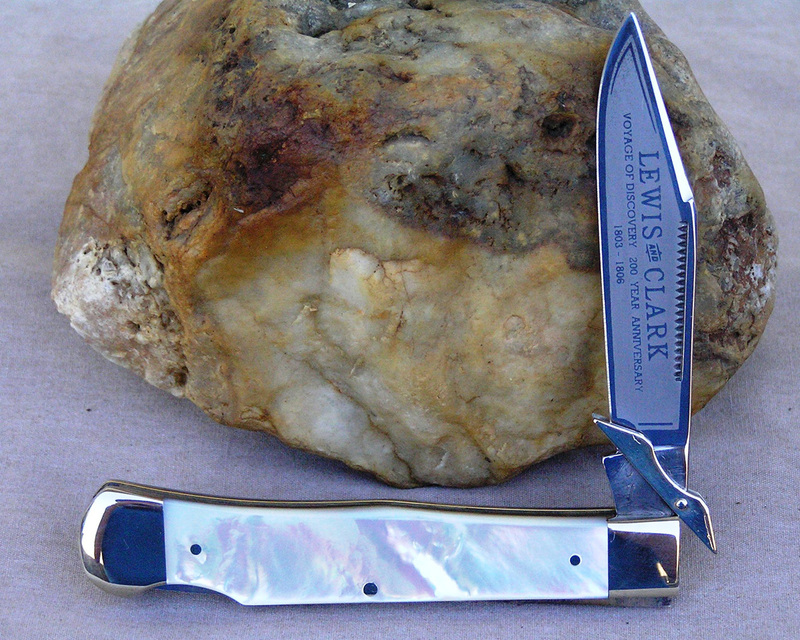 The Single Lockback blade has the Lewis and Clark 200 Year Anniversary etch and features a swinging guard. The tang is stamped with the Fighting Pit-Bulls. 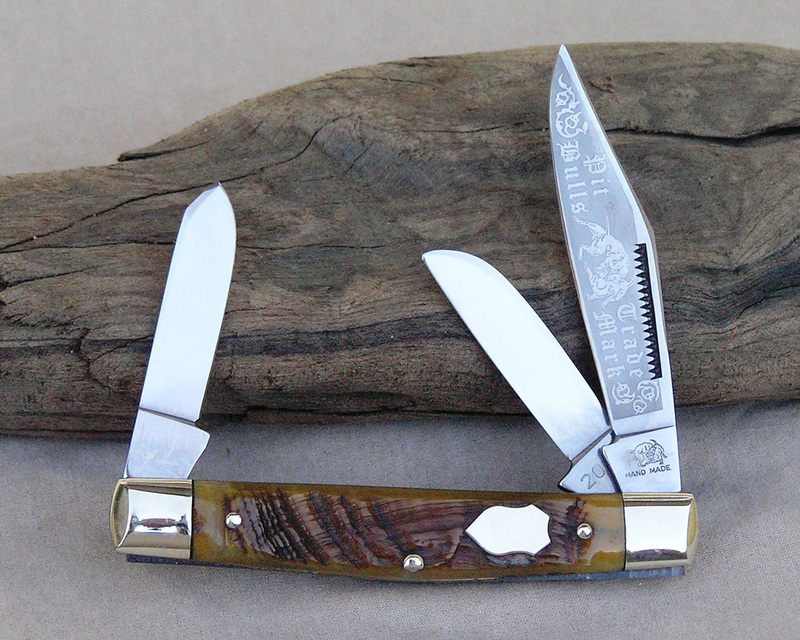 The handles are Hand Selected Mammoth Tooth. The liners and backsprings have been file worked and the Bolsters have been textured by Jeff. Jeff Jones Customized. 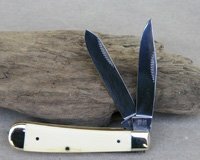 This knife is also shown in Custom Knives. This picture shows the Prototype set of ?Exotic? 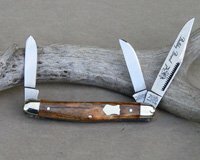 Lewis and Clark Swing Guard PROTOTYPE Lockbacks. These knives are 4 inches closed. 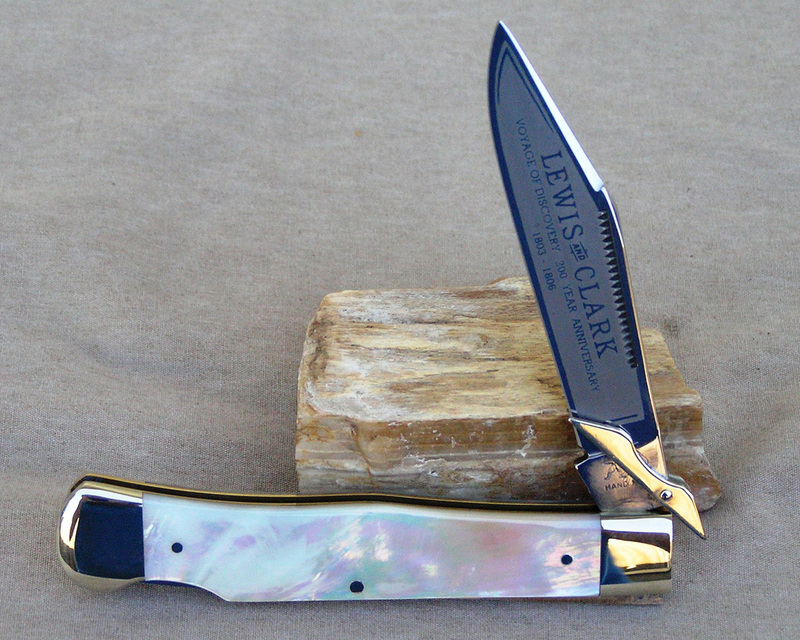 The Single Lockback blades have the Lewis and Clark 200 Year Anniversary etch with Prototype engraved on the reverse and features a swinging guard. The tangs are stamped with the Fighting Pit-Bulls. 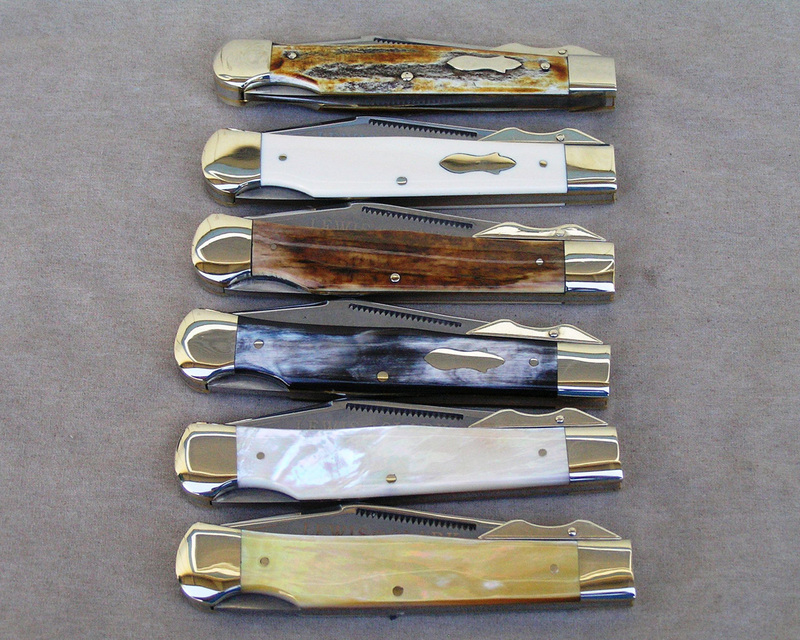 The handles, from top to bottom are Sambar Stag, Interior Mastodon Ivory, Bark Mastodon Ivory, Buffalo Horn, AAA1 Quality Pearl, and Gold Lip Pearl. All knives came with a COA signed by Jim Parker. This is a 4 inch closed Lewis and Clark Swing Guard Lockback. The Single Lockback blade has the Lewis and Clark 200 Year Anniversary etch and features a swinging guard. The tang is stamped with the Fighting Pit-Bulls. The handles are Sambar Stag with a Bomb Shield. PRODUCTION KNIFE. This is a 4 inch closed Lewis and Clark Swing Guard Lockback. 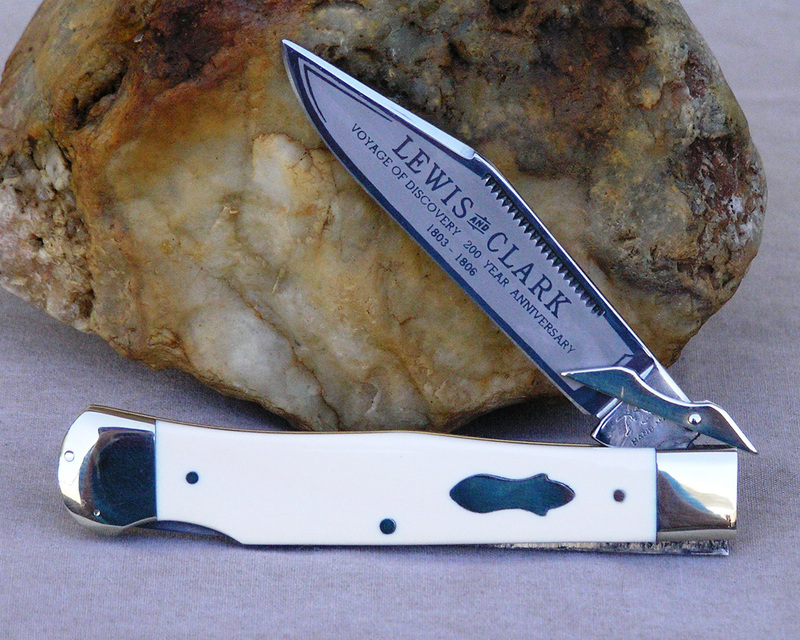 The Single Lockback blade has the Lewis and Clark 200 Year Anniversary etch with Prototype engraved on the reverse and features a swinging guard. The tang is stamped with the Fighting Pit-Bulls. The handles are Sambar Stag with a Bomb Shield. 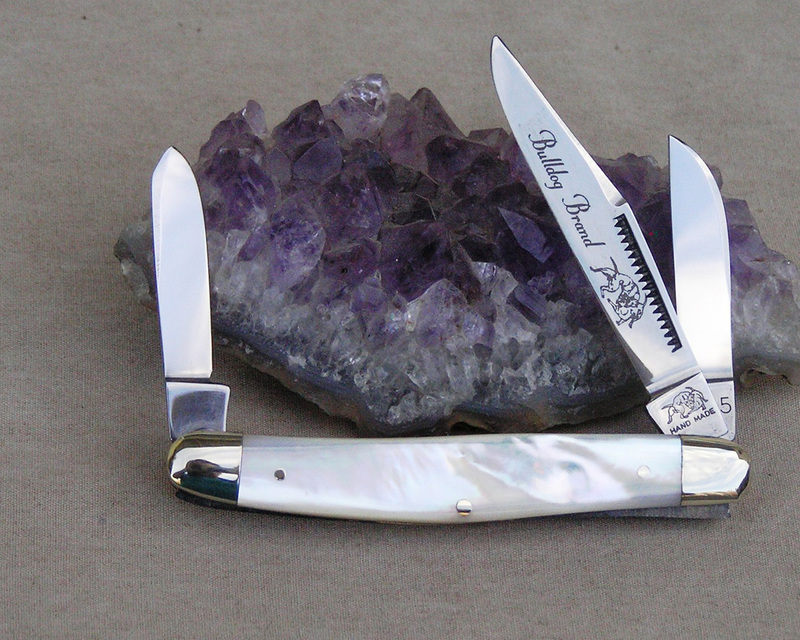 This knife came with a COA signed by Jim Parker. 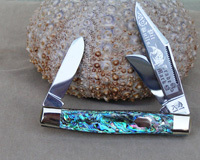 CUSTOMIZED by Jeff Jones of Jones Cutlery. This is a 4 inch closed Lewis and Clark Swing Guard Lockback. 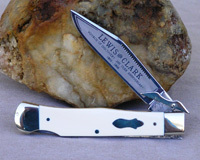 The Single Lockback blade has the Lewis and Clark 200 Year Anniversary etch and features a swinging guard. The tang is stamped with the Fighting Pit-Bulls. 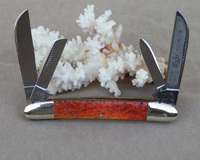 The handles are Hand Selected Tiger Coral re-handled by Jeff Jones. This knife is also shown in Custom Knives. CUSTOMIZED by Jeff Jones of Jones Cutlery. This is a 4 inch closed Lewis and Clark Swing Guard Lockback. 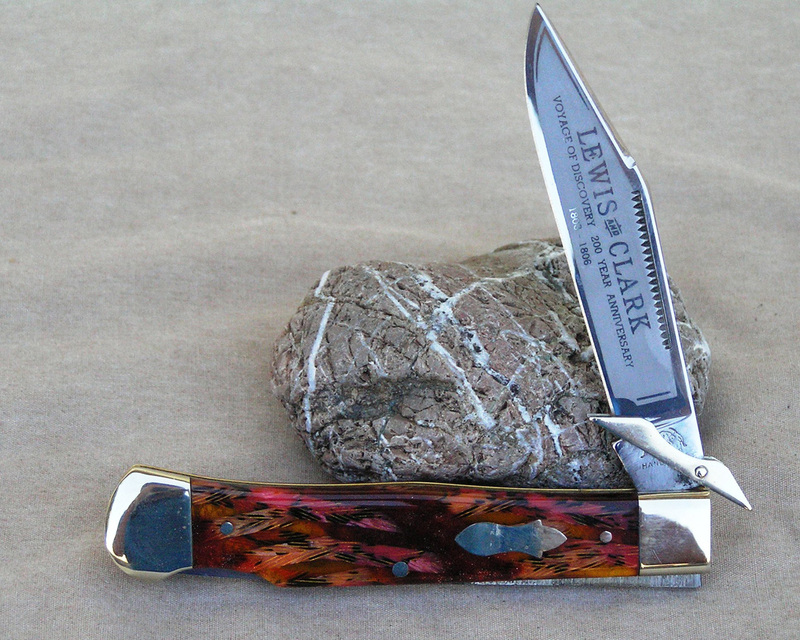 The Single Lockback blade has the Lewis and Clark 200 Year Anniversary etch and features a swinging guard. The tang is stamped with the Fighting Pit-Bulls. The handles are Hand Selected Apple Coral re-handled by Jeff Jones. 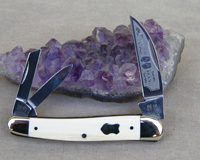 This knife is also shown in Custom Knives. 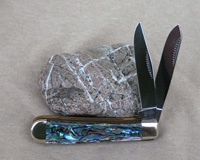 This is a 3 inch closed 2 blade Baby Sunfish Millennium knife. The tangs have the 2000 Standing Dog Stamp. The master blade has a full color Sunfish etched on it and is engraved with 1 of 24 on the reverse. The handles are Bark Mastodon Ivory with the Year 2000 shield. 1 of 24 made. 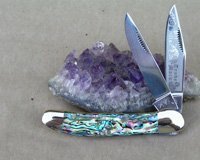 This is a 3 inch closed 2 blade Baby Sunfish Millennium knife. The knife has the Year 2000 shield. 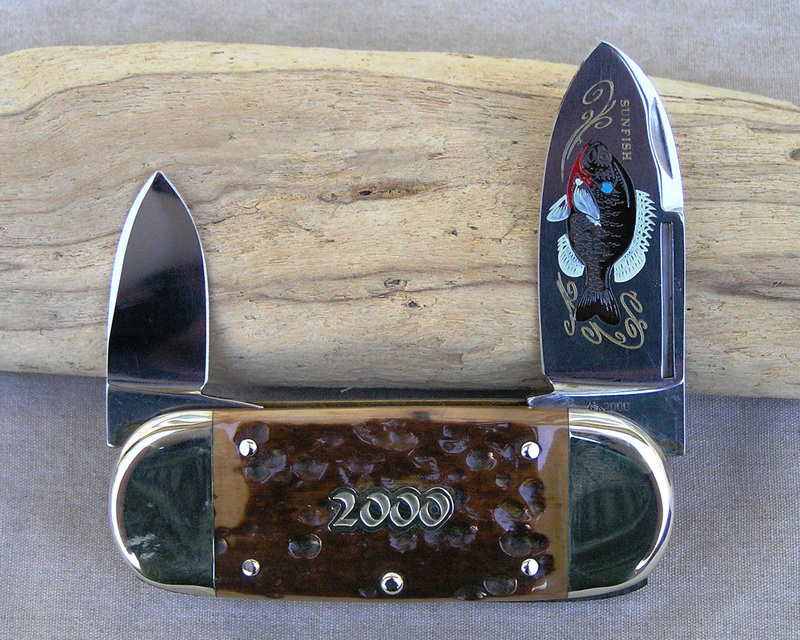 The master blade has a full color Sunfish etched on it and is engraved with 1 of 24 on the reverse. The handles are Genuine Gold Lip Pearl and the bolsters have been Engraved. Was 1 of 24, after market engraving makes it a 1 only. This is a 3 3/4 inch closed 2 blade Copperhead Millennium knife. 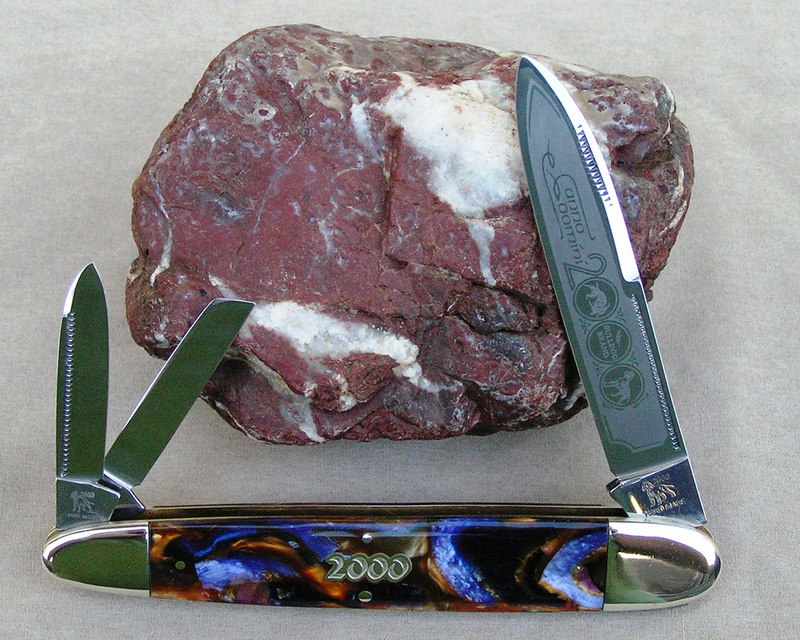 This knife features the Standing Dog 2000 tang stamp. The master blade is etched with the special Anno Domini Year 2000 etch. The reverse of the main blade is etched with “Prototype”. 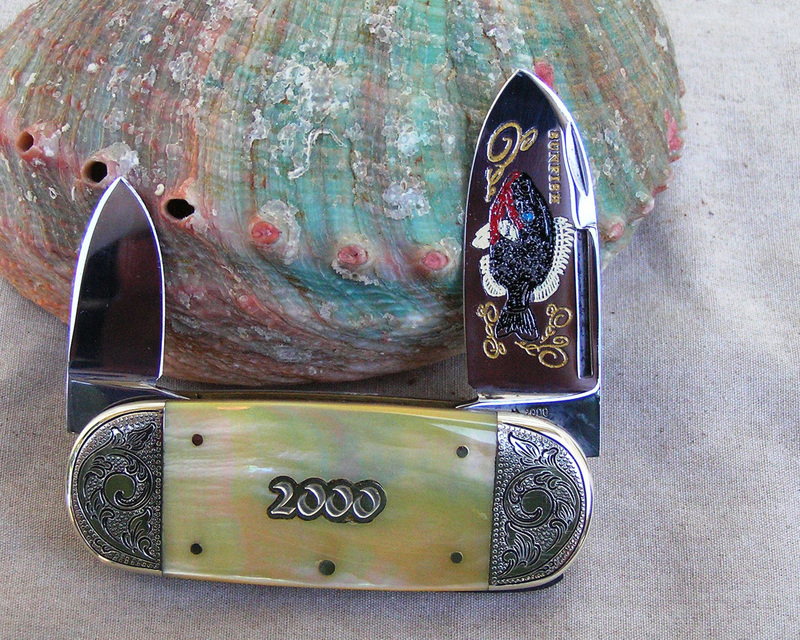 The handles are Genuine Pearl with a lot of color with the Year 2000 Shield. This is a 3 3/4 inch closed 2 blade Copperhead Millennium knife. 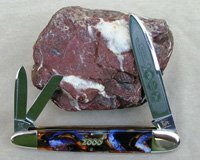 This knife features the Standing Dog 2000 tang stamp. The master blade is etched with the special Anno Domini Year 2000 etch. The reverse of the main blade is etched with “Prototype”. The handles are Genuine Stag with the Year 2000 Shield. This is a 3 1/2 inch closed Stockman Millennium knife features the Standing Dog 2000 tang stamp. The master Blade is etched with the special Anno Domini Year 2000 etch. The reverse of the master blade is etched with “Prototype”. The handles are Genuine Stag with the Year 2000 shield. This is a 5 1/4 inch closed Anglo-Saxon Whittler Millennium knife. This knife has the Year 2000 Standing Dog tang stamp. The master spear blade is etched with the special Anno Domini Year 2000 etch. 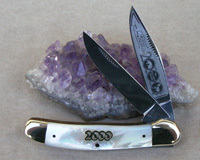 The handles Purple Swirl Celluloid with the Year 2000 shield. This is a limited edition of 60 knives made. 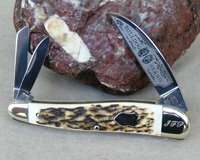 This is a 3 1/2 inch closed Stockman Millennium knife. This knife has the Double Dog head tang stamp. The master blade is etched with the Double Dog Head Etch. The reverse of the master blade is etched with “Prototype”. The handles Green Bone with the Year 2000 shield. This Presentation Trapper Model knife features the Double Dog head tang stamp. It is 3 1/4 inches closed. The master blade has the Double Dog Head etch and is engraved PROTOTYPE on the reverse. The handles are Buffalo Horn with a Heraldic Shield. This knife came with a COA. 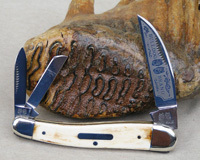 This Presentation Trapper Model knife features the Double Dog Head tang stamp. It is 3 1/4 inches closed. The master blade has no etch but is engraved on the reverse 1 of 5. 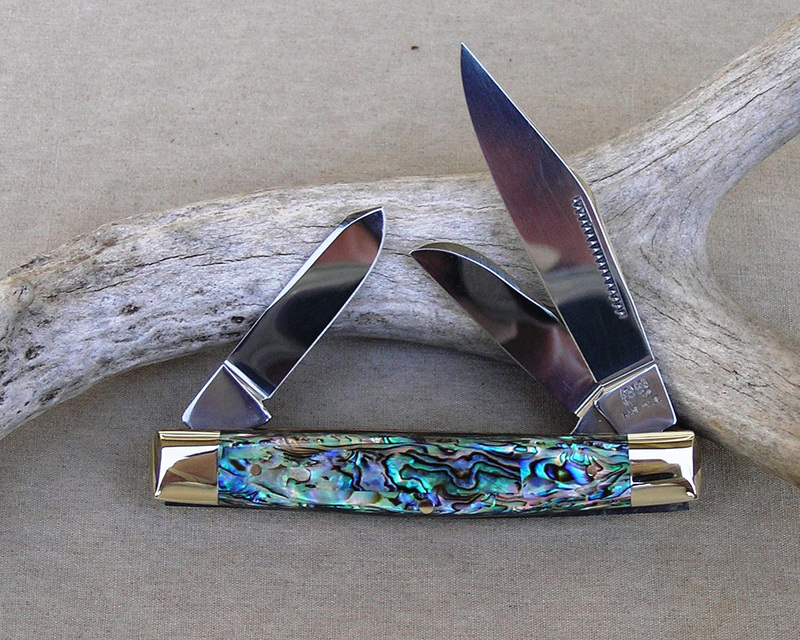 The handles are Genuine Heart Abalone with no shield. This knife came with a COA. 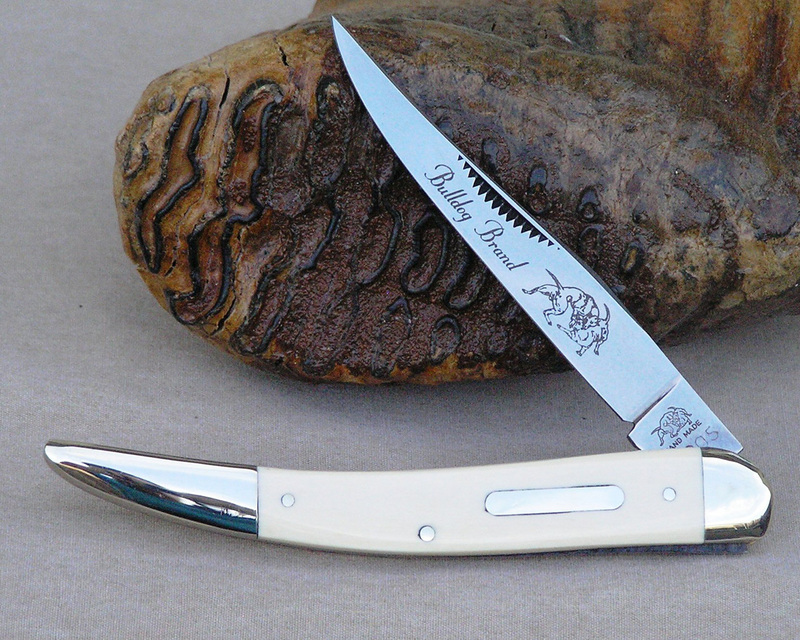 This Presentation Trapper Model knife features the Double Dog head tang stamp. It is 3 1/4 inches closed. The master blade has the Double Dog Head etch and is engraved PROTOTYPE on the reverse. The handles are Genuine Stag with a Heraldic Shield. This knife came with a COA. There probably won’t another one made like this. 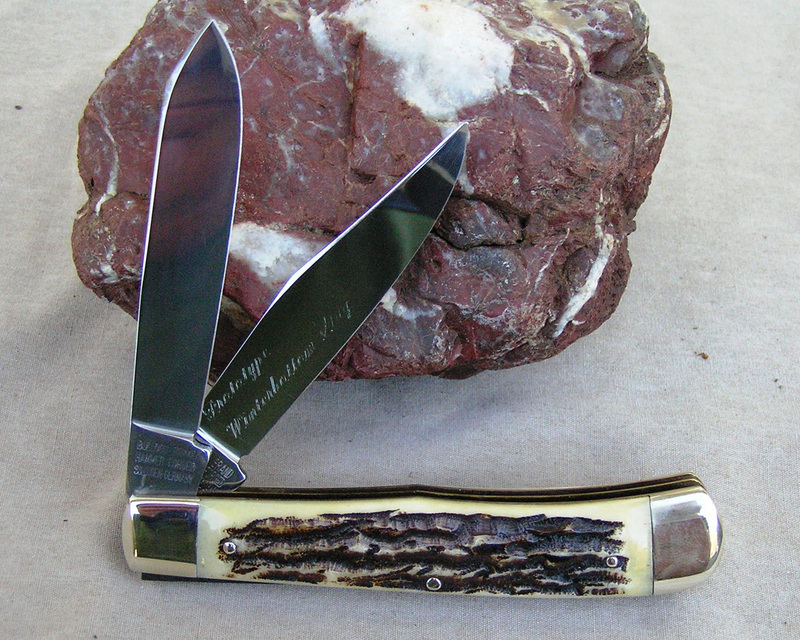 This Presentation Trapper Model knife features the Double Dog Head tang stamp. It is 3 1/4 inches closed. The master blade has no etch but is engraved on the reverse 1 of 5. The handles are Interior Mastodon Ivory with no shield. 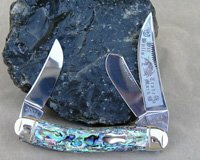 This knife is also pictured with the Mastodon Ivory knives. ONLY 5 MADE! 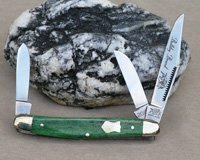 This is a 3 blade Viking model Warncliff Whittler. The master blade is etched with the Double Dog Head etch and engraved 1 of 33 on the reverse. The tang is stamped with the Double Dog Head Stamp. Overall length of this knife is 3 7/8 inches closed. The handles are Genuine Abalone with a bar shield. This knife comes with a COA that states only 33 were made. 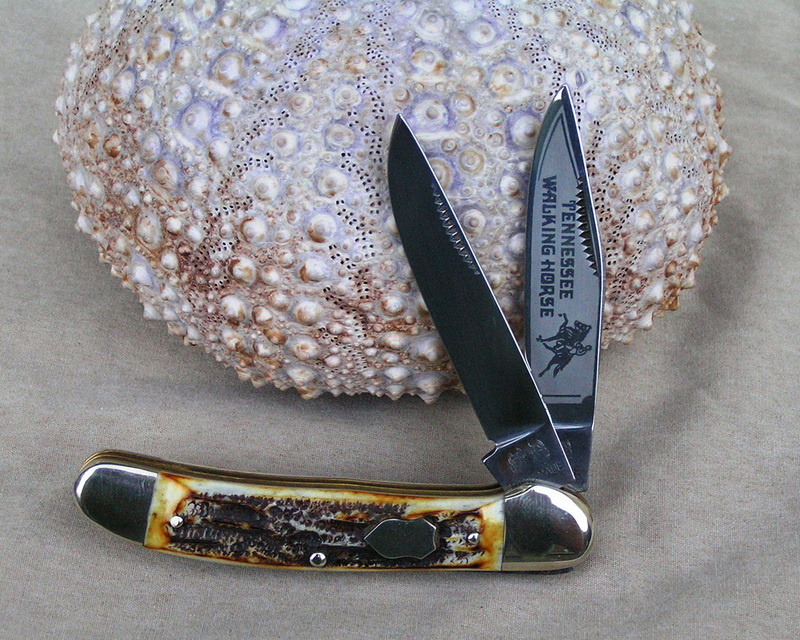 This is a 3 blade Viking model Warncliff Whittler. The master blade is etched with the Double Dog Head etch. The tang is stamped with the Double Dog Head Stamp. 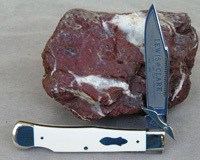 Overall length of this knife is 3 7/8 inches closed. The handles are Antique Elephant Ivory with a bar shield. There were only 21 of these made making this a fairly rare knife. 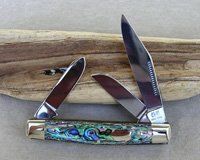 This is a 3 blade Viking model Warncliff Whittler. The master blade is etched with the Double Dog Head etch and engraved 1 of 33 on the reverse. The tang is stamped with the Double Dog Head Stamp. Overall length of this knife is 3 7/8 inches closed. 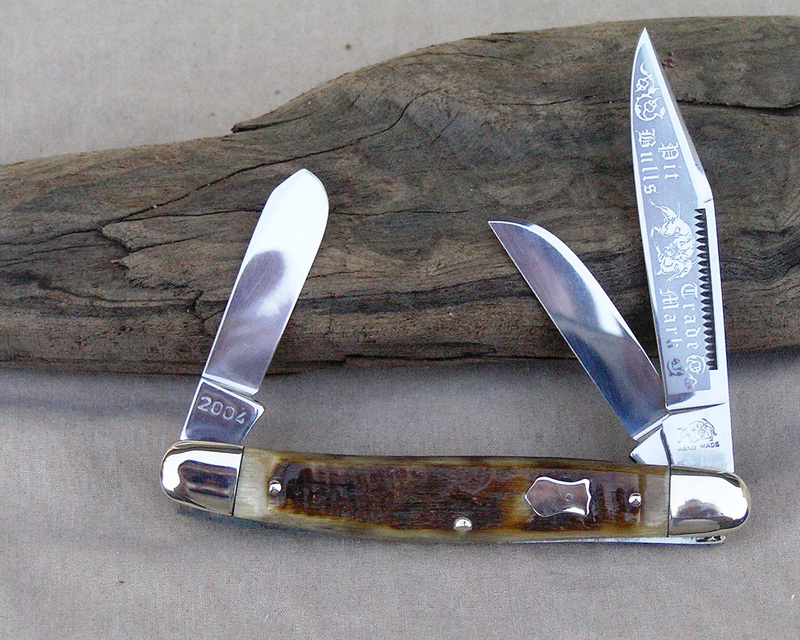 The handles are Bark Mastodon Ivory which comes from the outer tusk with a bar shield. This knife comes with a COA that states only 33 were made. 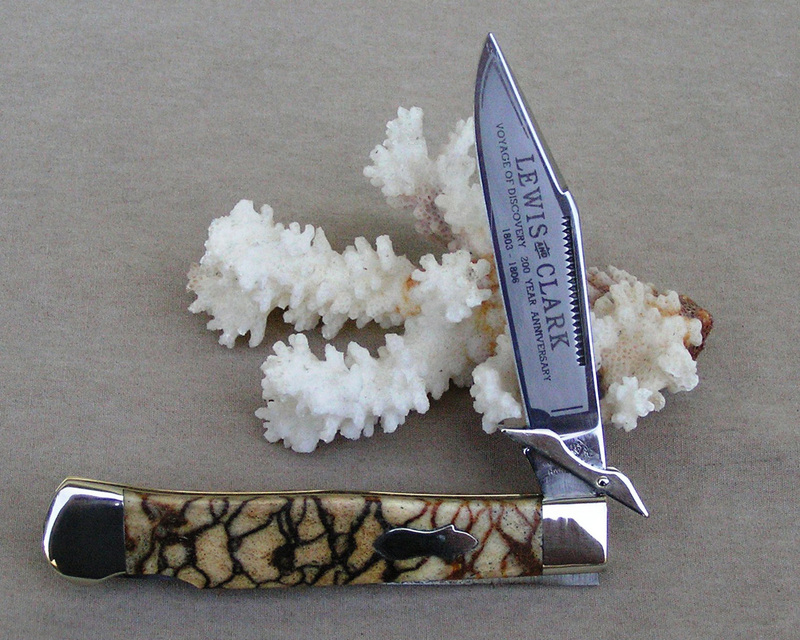 This knife is listed in the Mastodon Ivory knives also. This is a production Seductress with Black Lip Pearl handles. The master blade etch is a woman lying down with ?SEDUCTRESS?. The tangs are stamped with the Double Dog Head Stamp. Even though this is a production knife, not many were made and it is hard to find. This is the only set of the Seductress model “PROTOTYPE” knives with carbon steel blades. 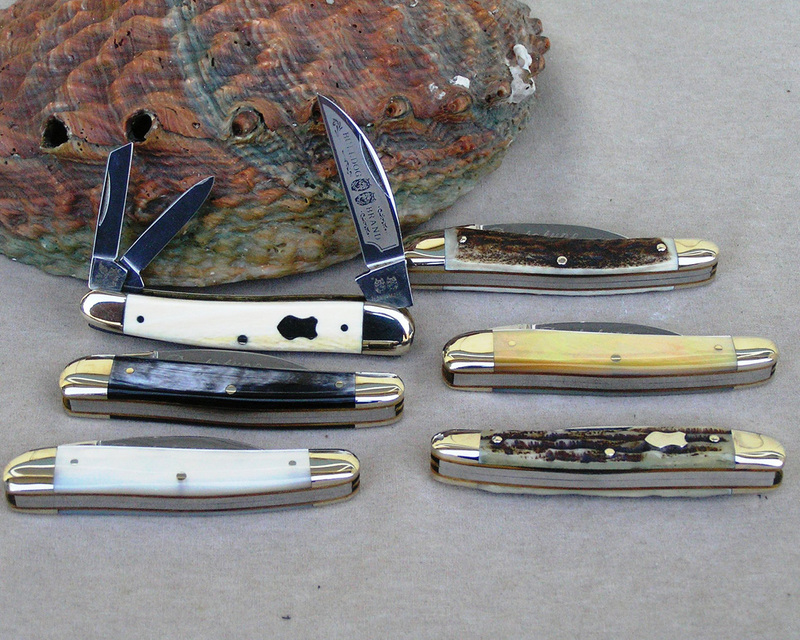 Six knives total, one each handled in Stag, Winterbottom, Buffalo Horn, Gold Lip Pearl, AAA1 Pearl, and Antique Elephant Ivory. This is the first and only Prototype release for the Seductress model which was released in 2003. The blade etch is the Double Dog Head etch. The tangs are stamped with the Double Dog Head Stamp. The reverse of each of the master blades is engraved with “Prototype”. This set is a one of a kind. All knives come with a COA and the shipping invoice. Only set of it?s kind with Carbon Steel ever made! This is a production Seductress with Gold Lip Pearl handles. The master blade etch is a woman lying down with “SEDUCTRESS”. The tangs are stamped with the Double Dog Head Stamp. Even though this is a production knife, not many were made and it is hard to find. 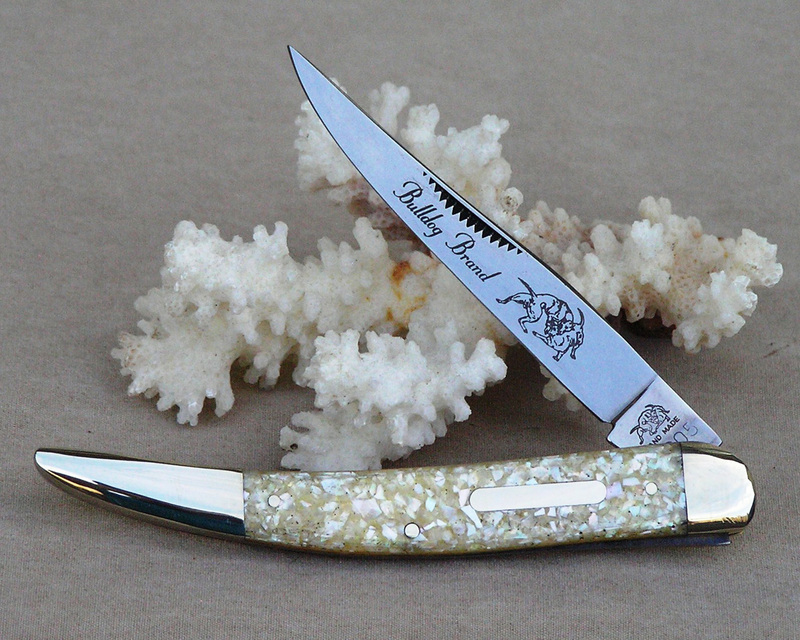 This is a production Seductress with Interior Mastodon Ivory handles. The master blade etch is a woman lying down with ?SEDUCTRESS?. The tangs are stamped with the Double Dog Head Stamp. Even though this is a production knife, not many were made and it is hard to find. 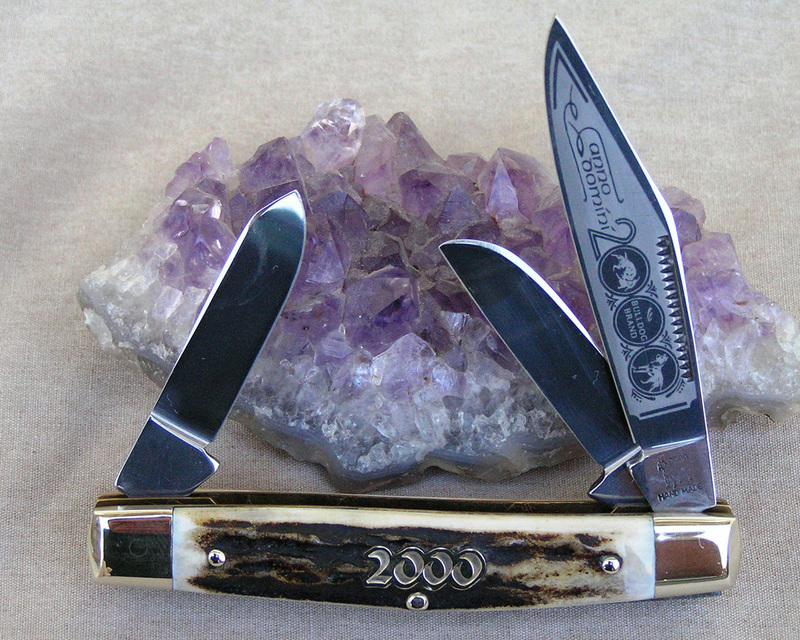 This is the Interior Mastodon Ivory handled knife of the Seductress Prototype with Carbon Steel blades for the Seductress model which was released in 2003. The master blade etch is the Double Dog Head etch the reverse of the master blade is engraved with “Prototype”. The tangs are stamped with the Double Dog Head Stamp. This knife has a COA. From the Seller: This knife is 4 1/8″ closed and features the nickel silver pinned Genuine Stag scales and the initials of my father, the late Jim Parker on the bolster. We found this knife in some of my dad’s knives recently. 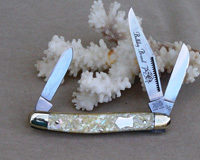 We will provide a certificate to the winning bidder verifying this was one of the knives out of his knife collection. 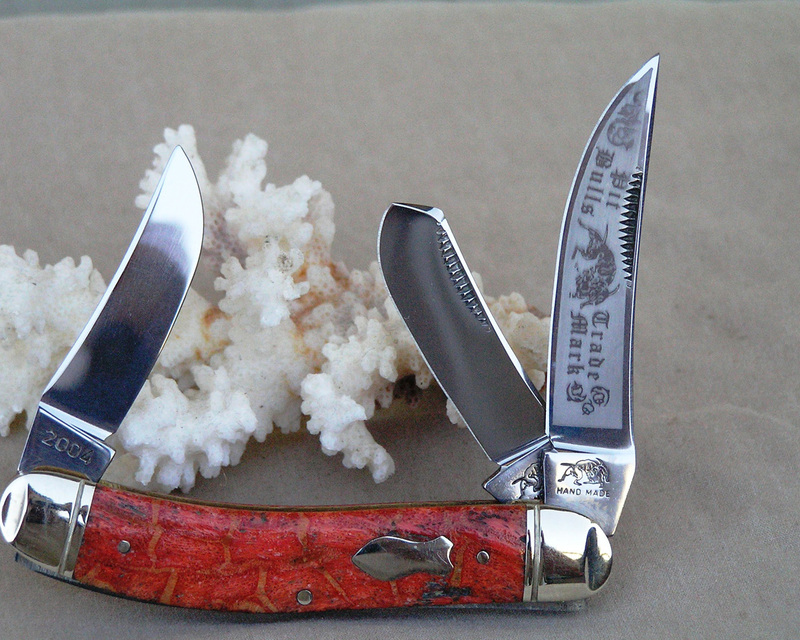 The master Wharncliff blade features the well liked famous trademarked Double Dogs head stamp and Hand Made. The rear side of the master Wharncliff blade is factory etched with “Manchu 9th Infantry Regiment WW I WW II Korea Vietnam Panama Keep Up The Fire”. The rear tang of the master blade is stamped with Bulldog Brand Hammer Forged Solingen-Germany. This master Wharncliff blade features the reverse frosted Bulldog Brand with the Double Dogs head blade etching. This Genuine Stag Special Issue 9th Infantry Regiment Bulldog Brand Wharncliff Whittler is in mint condition. This knife came with a COA. 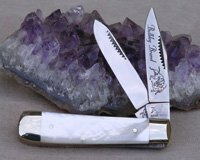 From the man who ordered these knives: This is a Bulldog 4 1/8 Thor model that was supposed to get a special reverse frosted etch, the Manchu etch. The factory screwed up the order and etched the backs as shown. 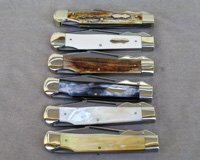 These 25 knives were returned to Jim Parker and the reverse etch knives were made. 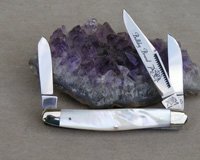 Apparently Mr. Parker kept the incorrect knives as his own and this one has his initials on it. 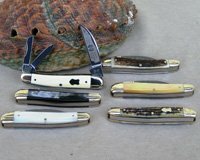 Once the knives were returned Mr. Parker was free to do with the rejects as he wished. 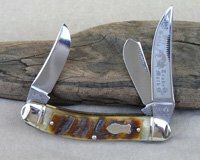 The man who ordered these knives served in the 9th Infantry Regiment in Vietnam, Mr. Parker did not. The 9th Infantry Regiment (Manchu?s) is a highly decorated and proud Regiment that served the United States since 1855.